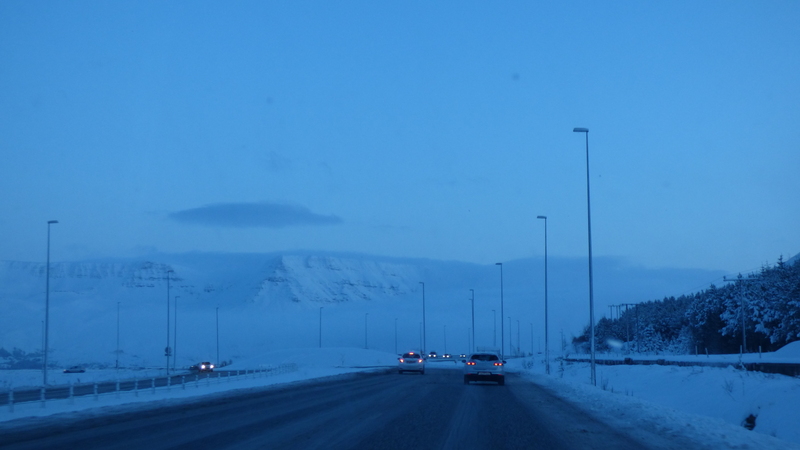 Arrived late afternoon in Reykjavik BSI station by plane and then coach, about 16:15, to be picked up by my fabulous hosts Hilmar Örn Agnarsson and Björg Þórhallsdóttir by car to bring me to my AirBnB stay at Fossegata 11. It’s a wonderful apartment with piano. This is the first time I meet Hilmar in person, we’ve been e-mailing and Skyping before. Hilmar is organist and choir director running three choirs. Björg is a soprano singer. 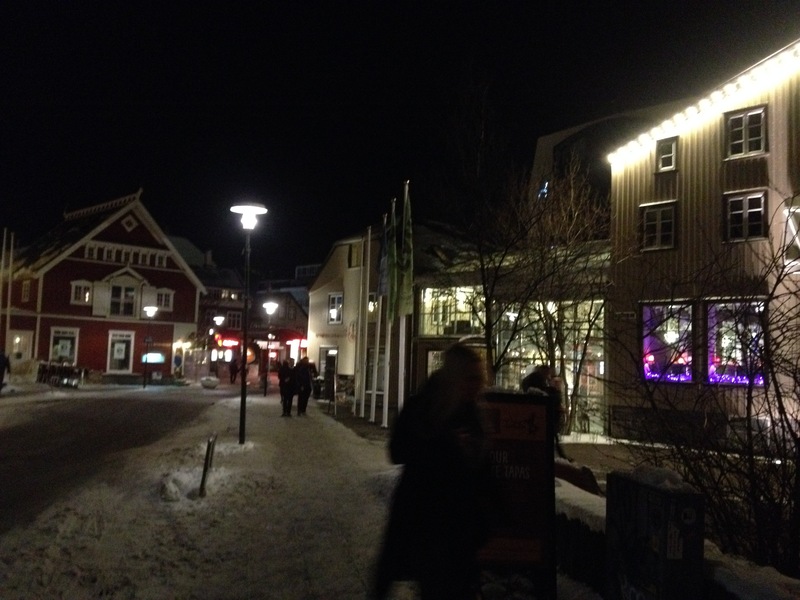 At 6 o’clock Thorunn Jonsdottir, project manager, picked me up at Fossegata for dinner at Hilmar and Björg’s house. Really nice to meet her in person, we too, have been emailing a lot and she’s been arranging the entire trip. 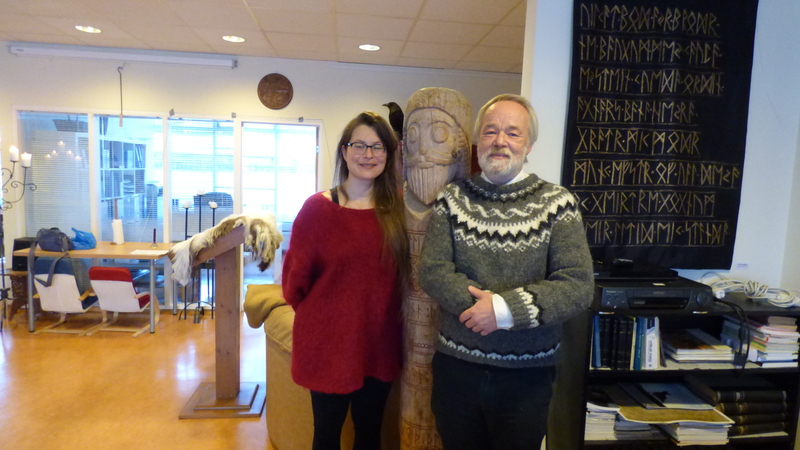 Thorunn brought a lovely piece of her own geometric artwork she made as a gift to Hilmar and Björg. Another example of her artwork she posted on facebook a few days later. Hilmar and Björg’s home is wonderful and full of art. Extremely nice atmosphere. Unfortunately I don’t have any photos of our evening there, as I felt a bit shy to do so. Dinner was white fish prepared in two different ways: one in a red sauce, a bit spicy, and one in a butter, dill and garlic. Both delicious. 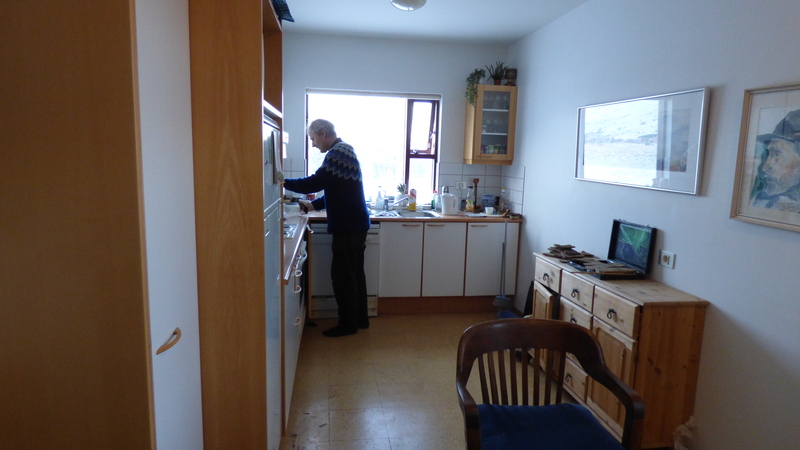 With rice, in some special way, really good, boiled potatoes in skin, that’s the best way to have potatoes in my opinion, and Icelandic very heavy rye bread. And some more vegetables, I’m quite surprised I can’t remember which ones, I must have been absorbed with the fish and rye bread. Was there a dill sauce? Meringue with fruit as desert. All very tasty an warm and welcome. 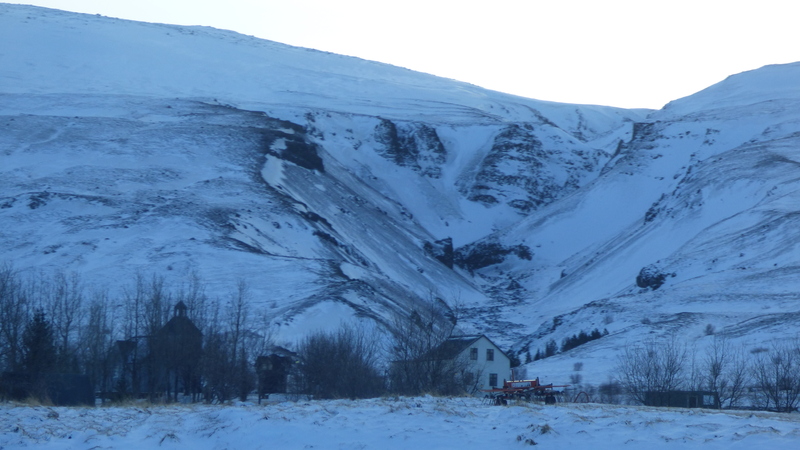 And yes, I’m writing down everything here, maybe to start a Friendly Guide To Iceland or maybe because it all matters. Like a Sherlock or a Marple: do not miss out on the details. 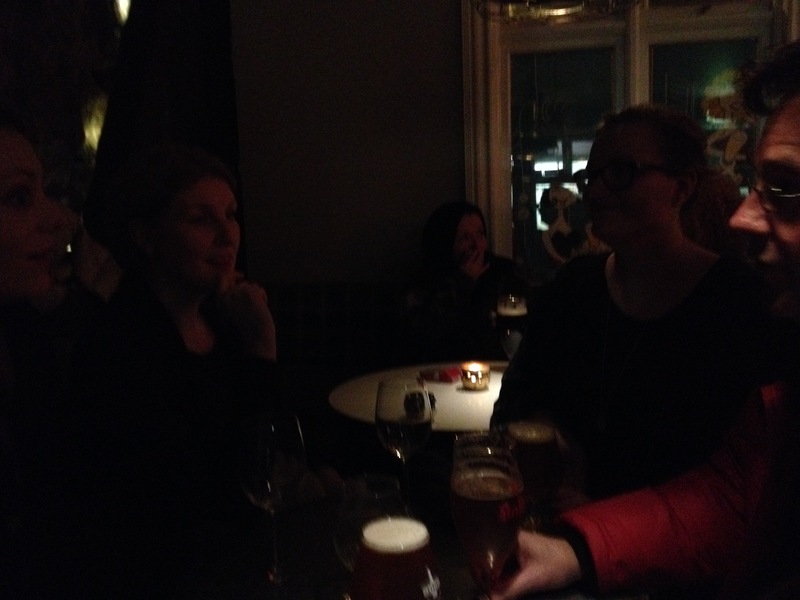 Thorunn hooked up with some of her friends and we went to a bar to meet up – Gudny Gudmundsdottir, Fjóla Sverrisdóttir and Guja Sandholt. 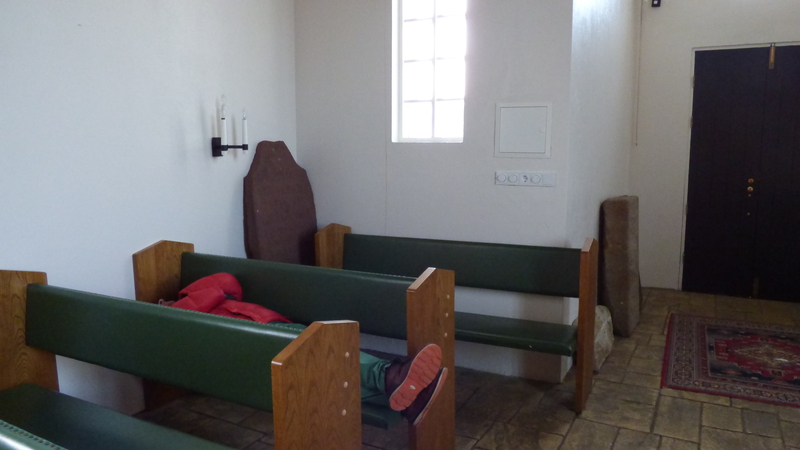 And Hilmar showed up later, after a choir practice. We talked about the Cycle festival amongst other festivals they are involved in, all these ladies are organisers in cultural events. Very enjoyable evening with interesting people and a very good start. I was in an insomnia loop from staying in Worthing and the New York trip, because of night time noise pollution, as such I didn’t sleep that night. Even though the apartment was wonderfully quiet. My planning was to get up early in the morning to reply to some requests from the Curated Place team re funding. Yet, due to my insomnia, getting up was extremely hard. I did manage to work for an hour, getting only half of the work done. Hilmar was going to pick me up at 1pm. 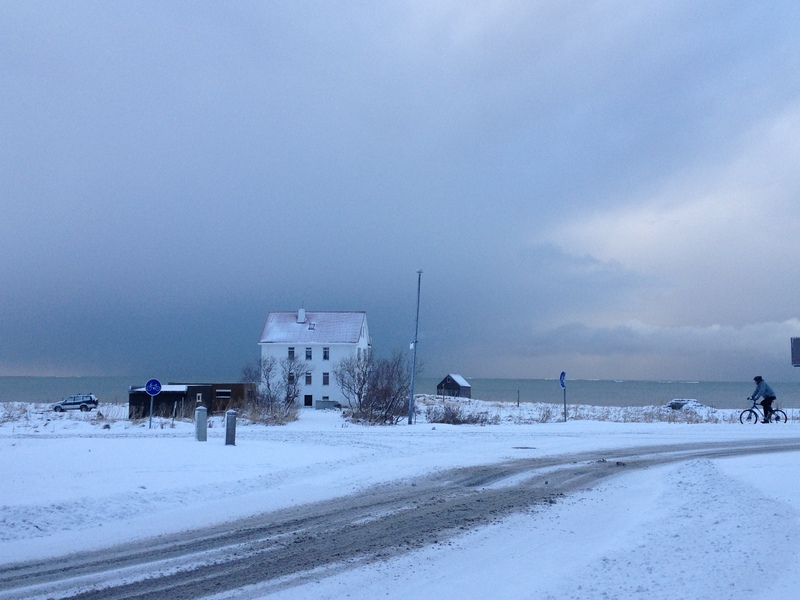 It was 11:30 by then, and I was recommended last night to go to the Vesturbæjarlaug swimming pool, a 25 mins walk away. So I’d better had going. 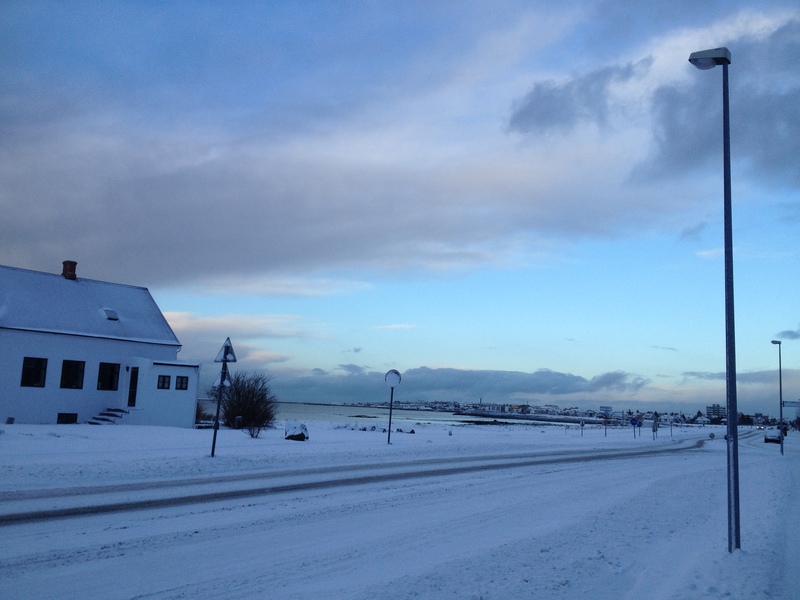 It was a wonderful walk along the ocean and the most nicest street of Reykjavik. I hadn’t eaten so I bought knäckebröt in the shop, the only thing I felt like eating, still feeling very ropy. The swimmming pool was sensational to a Dutch-British girl like me. 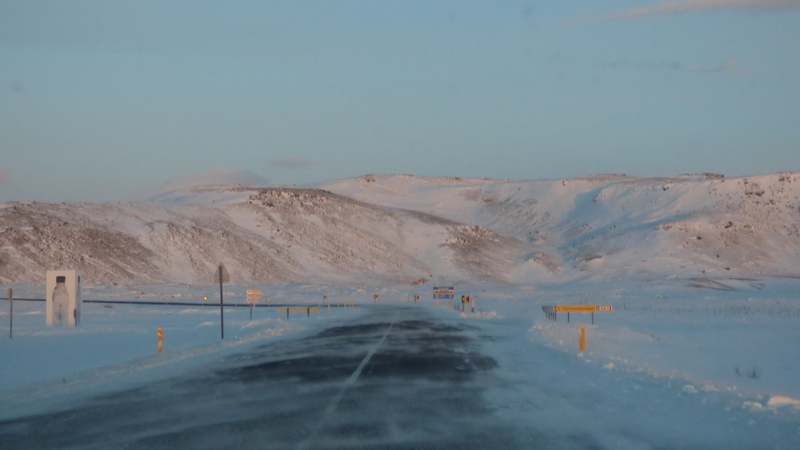 I love the Icelandic cleanliness (google if interested). 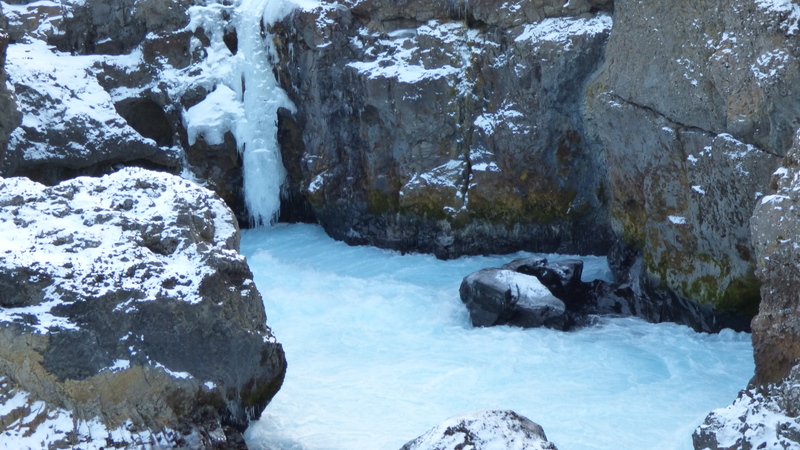 The outside temperture was -2 Celsius and I was bumbling about in my swimming costume! 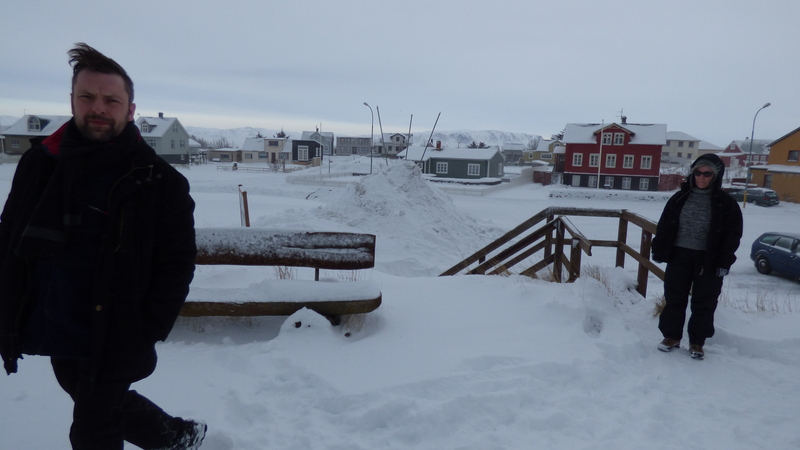 I’ve never felt the snow under my bare feet before. It’s lovely. All the baths are hot thermal water in various temperatures. Once in the hot tubs, it started to snow heavily. 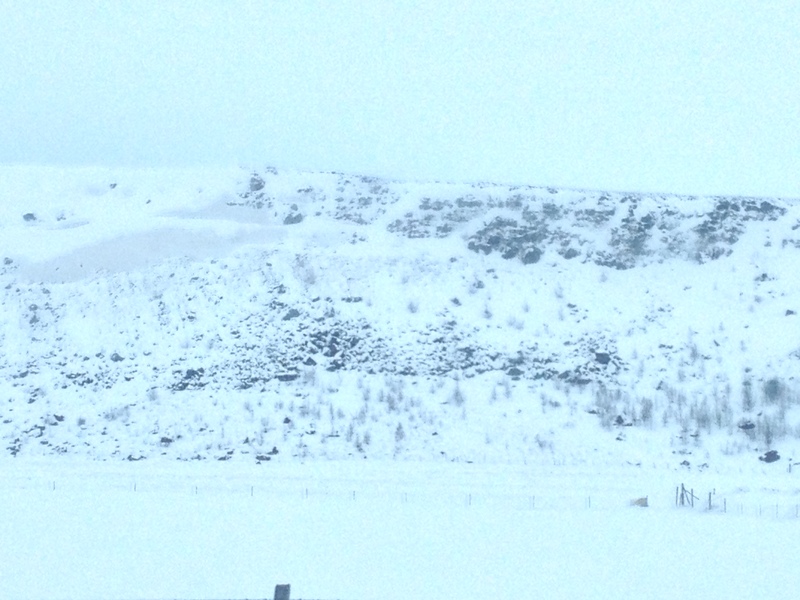 Steam and snow mixed visually, my head was covered in snow while my body was comfortably hot. “It’s the best! Especially in this weather,” said Gudny to me last night, and indeed it is. I completely perked up and all ropiness was gone. I couldn’t stop smiling, and chatted away about it to anyone who did or didn’t want to hear it in the baths. One lady caught on and we chatted for a bit. 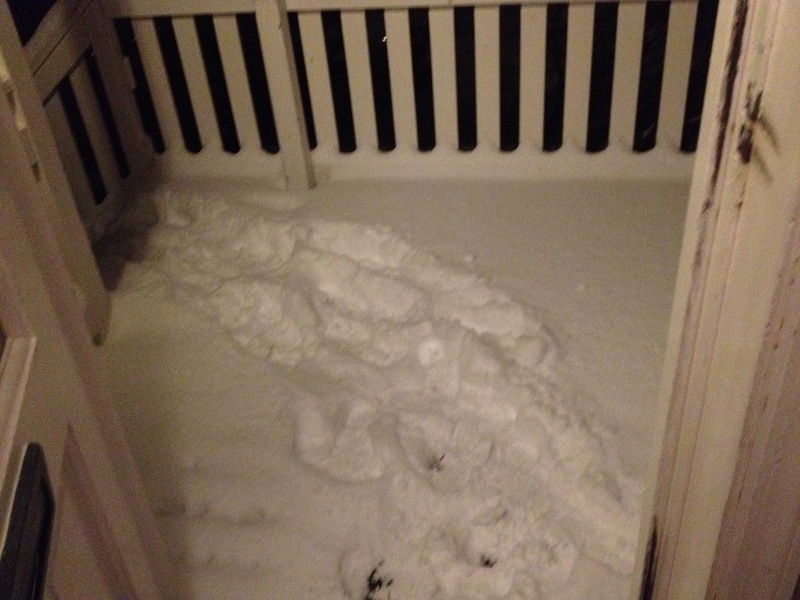 She covered herself with the snow that had freshly fallen on the seats next to the tubs when she got out – I wanted to try that for myself, too. Such a delight! Had the time of my life there. 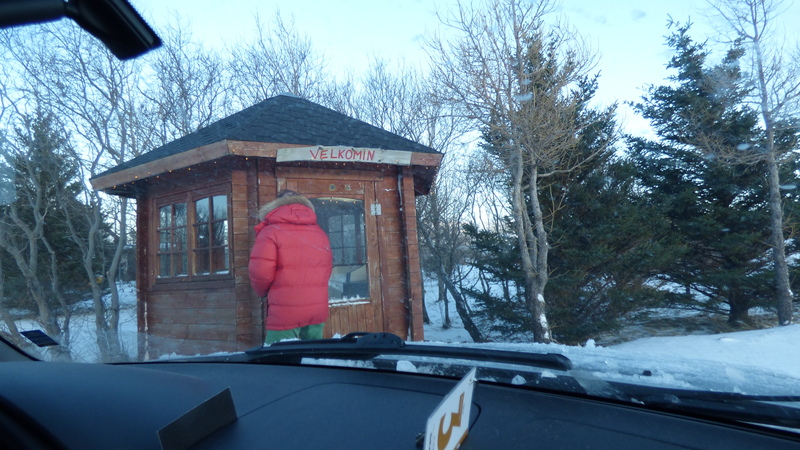 Time was up and I quickly went to get a take away coffee from Kaffihús Vesturbæjar next to the swimming pool, before Hilmar was picking me up to meet Katrin Thorvaldsdottir. 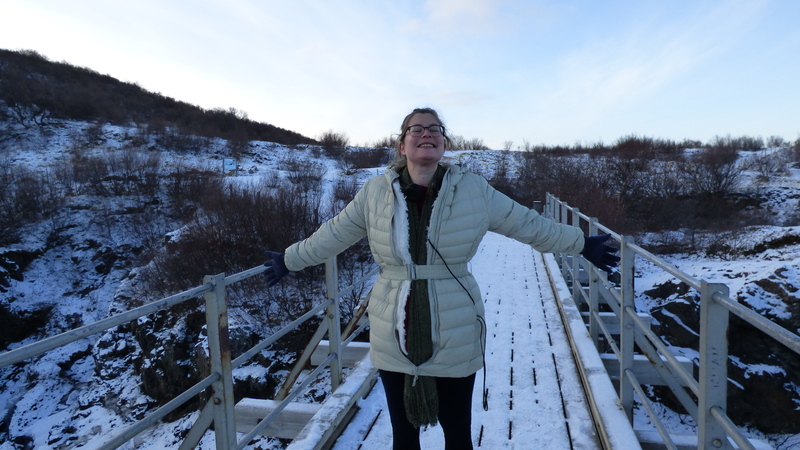 Visiting Katrín was an impromptu idea. 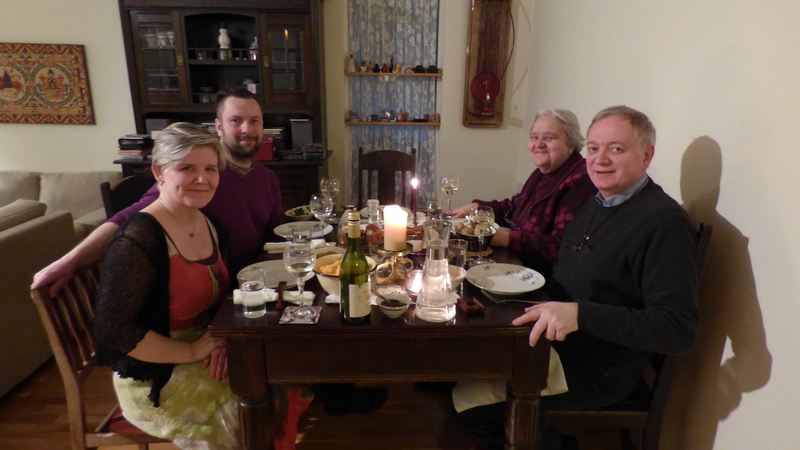 The night before, at the dinner table at Hilmar and Bjorg’s, I mentioned my interest for seaweed to which Hilmar jumped up and said we should meet Katrín. He phoned her straight away which was a good thing, as she was going to France in a few days and today would be the best opportunity. Our meeting was a parade of unlikely déjà vu’s. I’ve filmed the entire visit which was full of cheers and laughter. She owns a house full of incredible workshops and, together with a French chemistry assistant, she is developing ways of how to turn seaweed into a material to work with. As fabric or as building material. I’m extremely honoured she gave me a little piece of her experiments as I am aware how very precious her project must be to her at this development stage. If you know about seaweeds, you will know about how beautiful it is in the ocean, but as soon as you take it out, it will dry, shrink, discolour, get smelly and perish within a matter of hours. 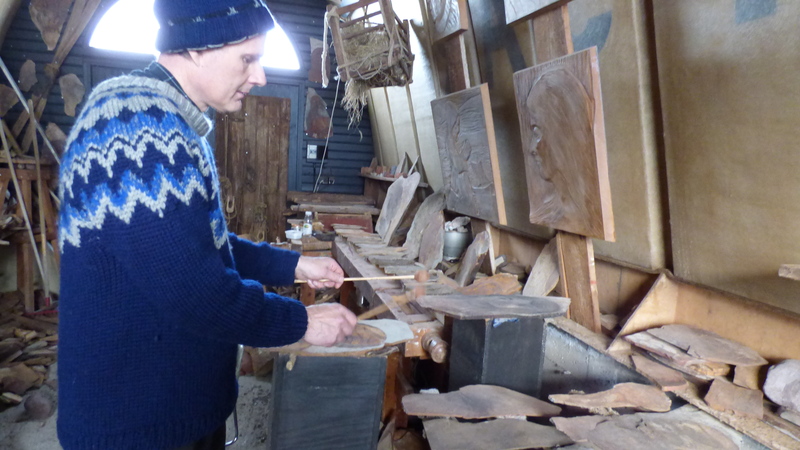 Katrín has managed to conserve its beauty in a sustainable way. Which seemed impossible to me! It’s still a work in progress, as she puts it: “This project is my baby, and you’re not putting your child out into the big world until it can walk, talk and be independent.” So it was an extreme honour to be allowed to film our visit, as well. 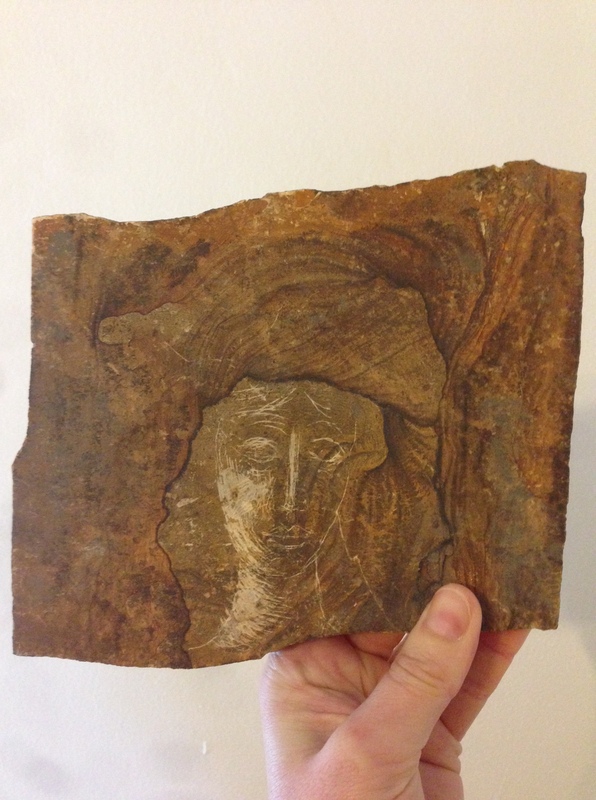 Most seaweed types that were present in her workshops also grow in Pembrokeshire. Her winged kelp and Laminaria Saccharina were especially beautiful. She had clothes hangers full of them in a closet, which made me laugh, as I would typically use clothes hangers to dry them, it was a very recognisable sight. Next to that she had tree bark lying about, another project of hers, which is something I had lying about around my house for a long time, too, trying to make an attractive sound proofing product out of it. It all made me smile. My speciality in seaweed lies more in the nutritional facts eating it and using it as topsoil for your vegetable plot – as such indirectly eating it once more, instead of using it as a material. The real cross-over with us is the nutritional use for skin care and remedies. Remarkably, with Katrín’s developments, the natural potency of seaweed is kept in tact. According to Katrin the sea is the Mother of the Earth, the Womb; She speaks. Having her more close to us in our daily lives will enrich us. 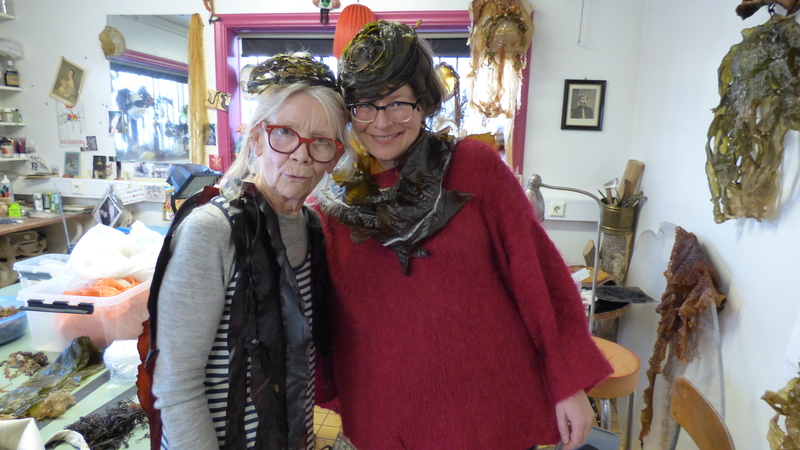 She’s been working a lot for theatre productions with costume designs and has been making seaweed masks. Yet these masks are of dried seaweeds. 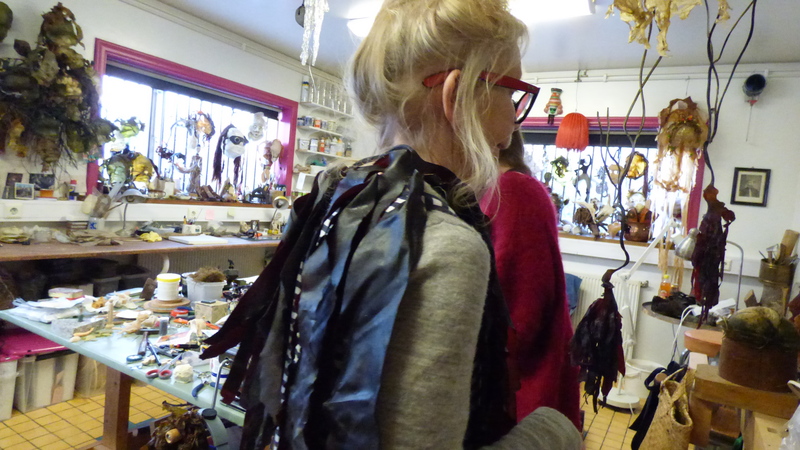 From the seaweed workshops in the souterrain she showed us the rest of the house full of curiosities and with stitching workshops which is another interest of mine. And when I gave her my postcard with the dolls picture, by my photographer friend Bronwen, it was her turn to laugh in recognition as she started collecting plastic dolls recently for another project of hers. Hilmar said we were sisters. It felt like we were. 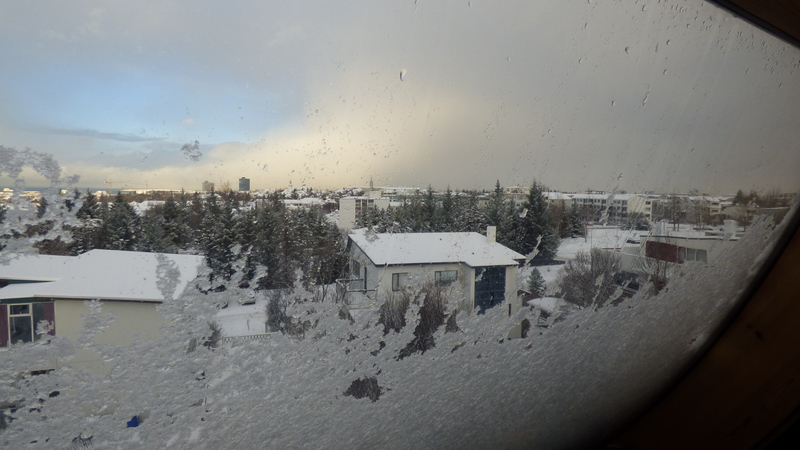 Reykjavik from Katrín’s roof window. 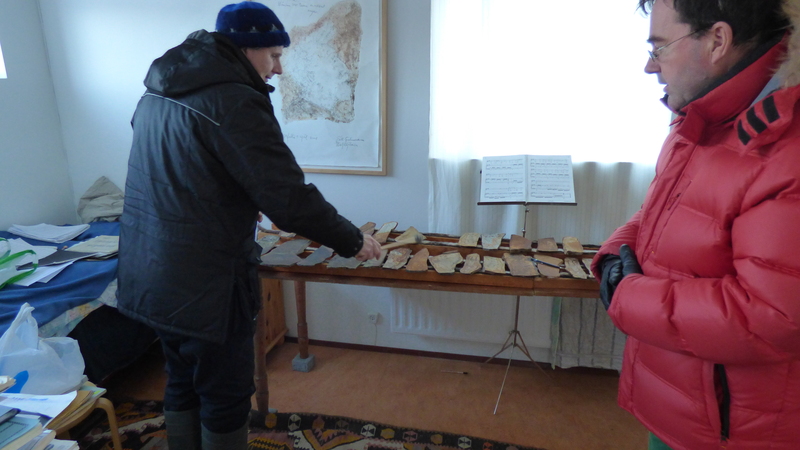 After Katrín’s visit we went to Hilmar Örn Hilmarsson, one of the most celebrated composers of Iceland. For his latest work he collaborated with two members of Sigur Ros, ‘Show of Shows’, a silent film of archive footage about circusses and showmasters late 19th century. 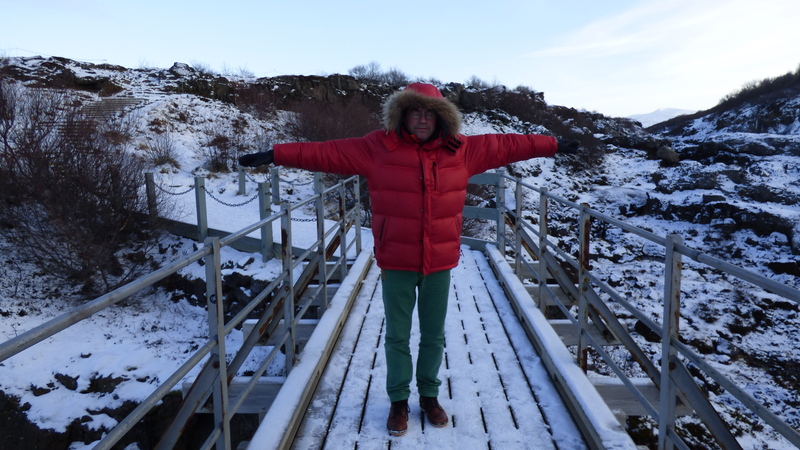 It’s been broadcast on BBC4 the Sunday before I arrived in Iceland. 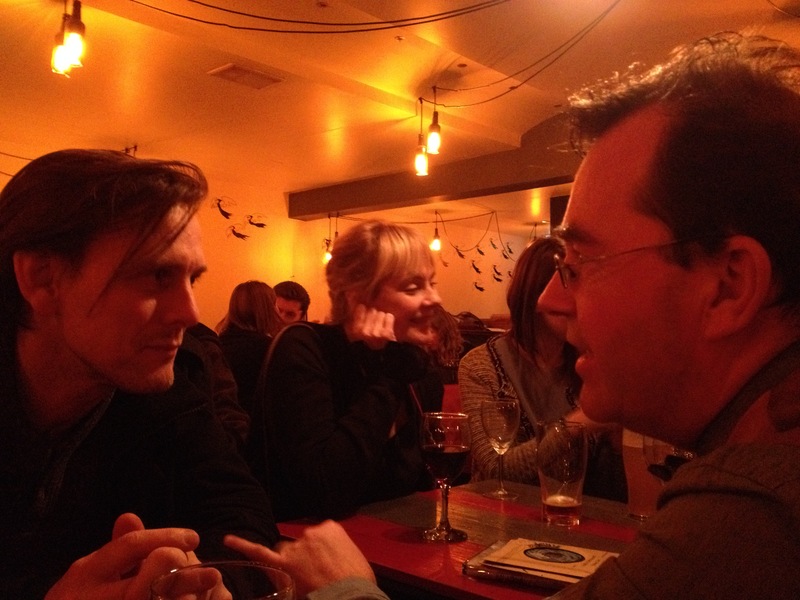 Hilmar Agnarson and Hilmar Hilmarson are best friends going back a long time in making Icelandic music history. We were invited for ‘Kaffee und Kuchen’ in the Ásatrúarfélagið office. Sat around the table were also Eileen, in photo below, who is from Ireland yet living in Iceland and fluent in Icelandic. To Eileen I spoke about languges, as my mother tongue is Limburg language, instead of Dutch, the official language of school. A language that isn’t written down and doesn’t have a name as there are many variations per town that I cannot understand myself. I’m trying to find roots of several words and hope to find a few in Icelandic. The Ásatrúarfélagið (English: Ásatrú Fellowship) is promoting and continuing Norse paganism and Hilmar H is the present high priest. We didn’t really address this in our chatting. 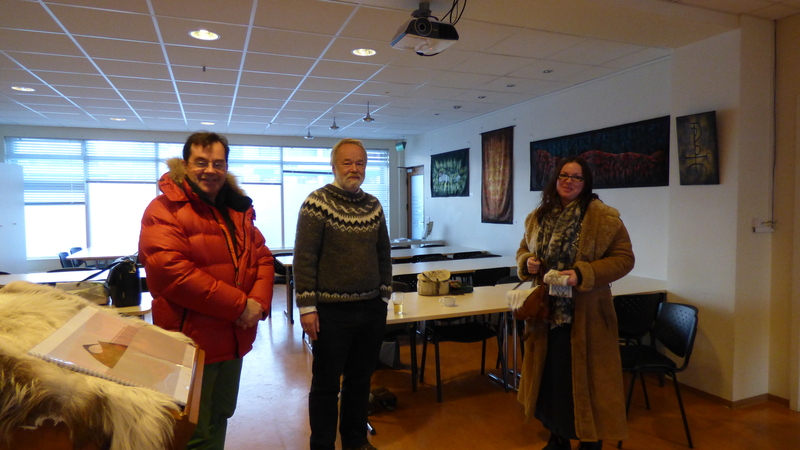 Hilmar Agnarsson asked ‘the other’ Hilmar about the historical relationship between Iceland and Hull, as Hull will be Cultural Capital of Europe in 2017 and there might be a chance my Moving Classics piece with Kammerkór Suðurlands might be performed there. Hilmar H mentioned a strong and perhaps still sore connection by the Cod War. I got enthusiastic about this link, as it might be very good to put these perhaps suppressed emotions on the table after all these years, maybe people would like to have their say. 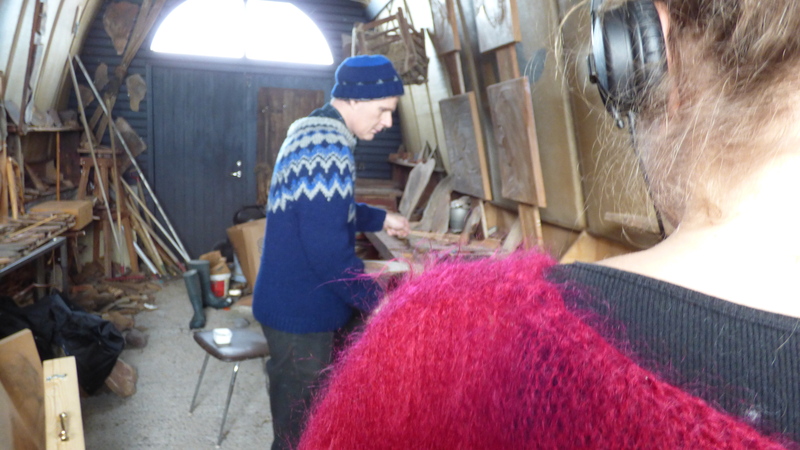 His friend Margrét Jonasdottir made a documentary about it, which would be good to watch. Hilmar A knows Margrét too and will get in touch with her. These developments are all very interesting. I mentioned that if this is all going to be followed up, a performance in Hull with Cod War content, however little or abstract that might be, it might be a great idea to see if BBC would be interested to broadcast the documentary in the days running up to the concert. Both the Hilmar’s started to discuss possible breakwaters to stage the concert on, but I think most of that information slipped me by, hoping to be listening back to it on the recording. Hilmar H showed us some bits of the ‘Show of Shows’ film – really wonderful to watch this with one of the composers himself. Somehow we started to talk about my work and how I often use concrete music or non-musicians in my pieces. Maybe we started about my concert at Vogue the week before and what on earth are prepared knitting needles and why? As such I explained that I’m interested in a certain timing that comes with featuring an act where its sound or rhythm comes secondary. That I used gymnasts in a work before, jumping on a box and on a crash matt. It sounds ‘clink … boink . boofff’ – spring … box . crash matt. There is a certain rhythm/cadence to it, but its parameters are depending on external non-musical influences, for example, how long the queue of gymnasts is, or when a gymnast thinks it’s safe to start jumping after the previous gymnast; how fast s/he runs, etc etc. All inspired by natural timings: the sound of a twig moving in the wind simply from left to right repeatedly has its timing always changing as the parameters of the wind energy are contstantly changing, not to mention the angle of the gusts. As a response to my explanations about my music, Hilmar H printed out a poem by …. and when he translated it to me, it was spot on, the choice of words and thoughts in the poem are beautiful. 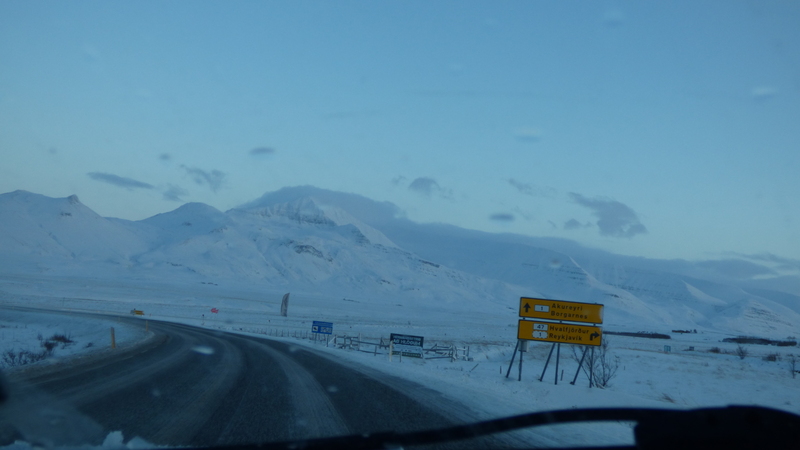 Soon Hilmar A and I were on our way again to my first ever rehearsal with Kammerkór Suðurlands. 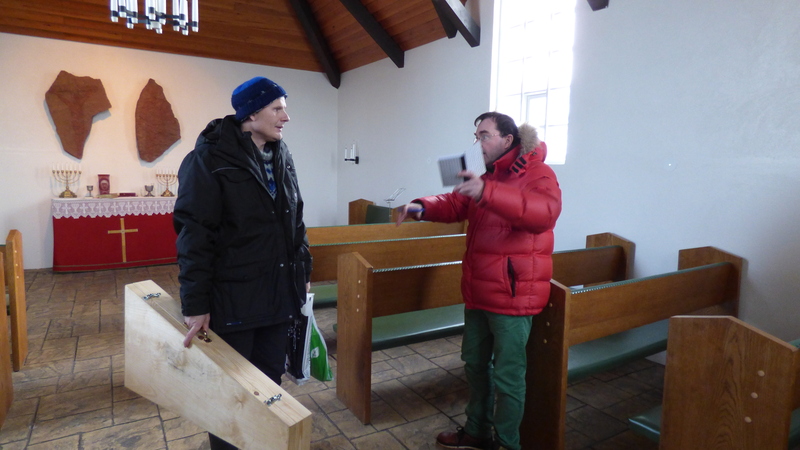 The rehearsal was in the Grafarvogskirkja. After a short introduction to the choir I simply sat on the side to listen to the voices as the instrument I’ll be working with in the not too distant future. I witnessed an entire piece unfold and come together, as its parts only arrived in Hilmar’s postbox that day. At the break I chatted with a few members. After the break a second choir was rehearsing in a space next to our space, and I recorded bits in the hallway in between the two choirs, mixing two sounds left and right. Yet it wasn’t only the two different compositions that sometimes mixed wonderfully – to even the volume balance between he two choirs I had to open the door to our choir a bit, causing a draft audible on the recording. I imagined it to be wind and weather, overruling the composed music, something I enjoy playing with in my works. 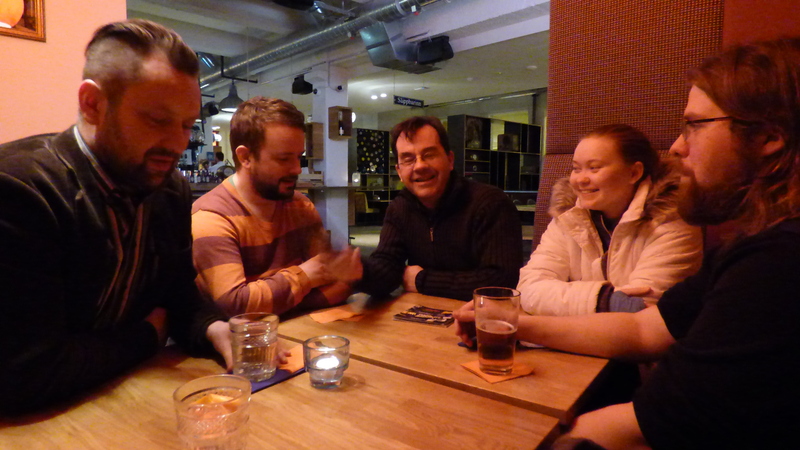 Following the rehearsal I went to the Slippbarinn restaurant with some choir members: Ölle, Johann, Bassi, Þórunn and mister film maker. Hilmar joined a bit later, after a next choir practice with a different, youth, choir. We were trying to find out how a frog sounds in Icelandic. 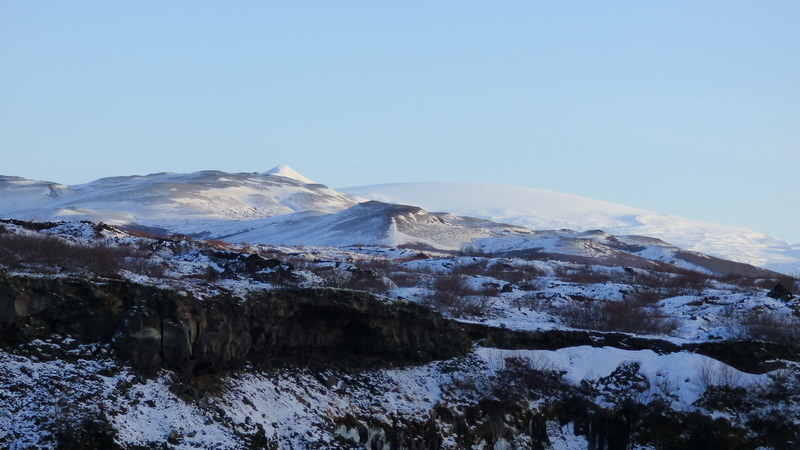 (…there are no frogs in Iceland). It was about midnight or after when I got back to Fossegata. Very tired and very satisfied. Lots of progress made this day in researching information for my commission. …Yet still no sleep. Hot shower, warm herbal tea. Nope. Reading a book in bed – something which usually bothers me as I can never read in bed because I fall asleep after haf a page – but, not much luck either. Tried the sofa, maybe the bed was no good. No. Maybe the direction isn’t right in the bed and I should sleep upside down. No. 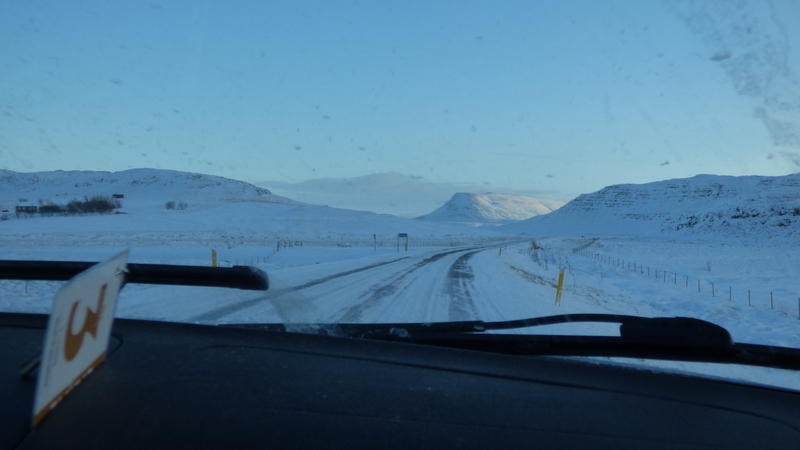 Hilmar was going to pick me up at 10am for a day out to Páll Guðmundsson in Húsafell, so I was very sad to be feeling a wreck in the morning. I lost count of the sleepless night by now. Stuck in a loop. I wished someone could caress and stroke me in my neck till I’d fall asleep, although if I would ask my better half George to do so, I think he’d fall asleep before me…. then I remembered I brought my tense machine for my back, its electric pulses massage your muscles. This machine usually sits in a drawer at home and I only get it out when I done my back. I got it out of the suitcase and put it in my neck. I drifted off soon. Hurray! 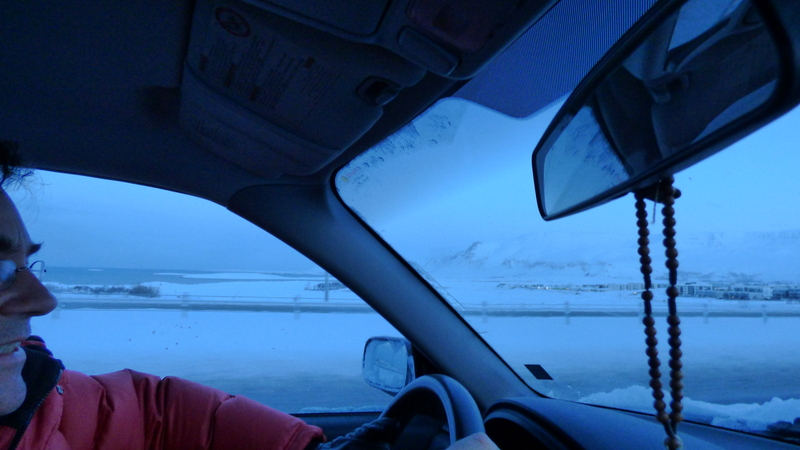 At 10am Hilmar was outside in his car to drive us both all the way to Páll Guðmundsson in Húsafell, a 2.5 hours drive inland. This was going to be another day full of wonders. 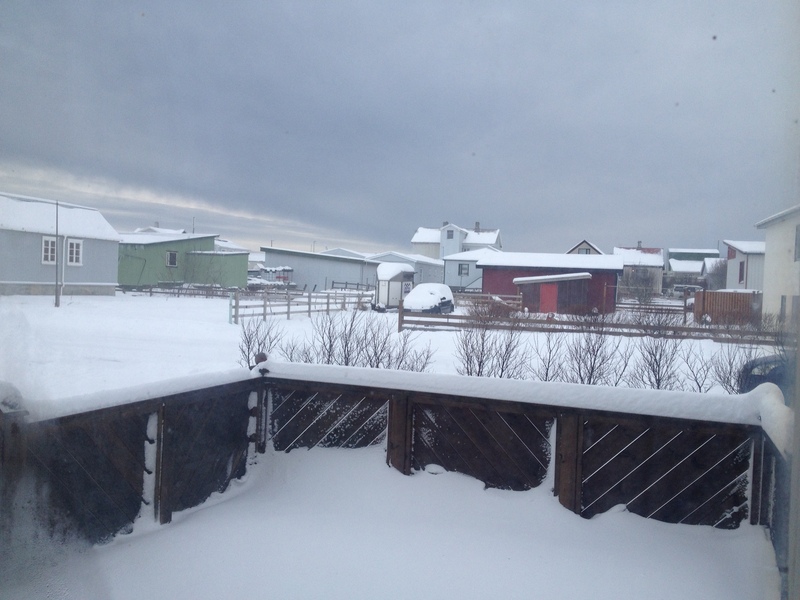 Lots of snow again outside. Such delightful sound under your shoes. 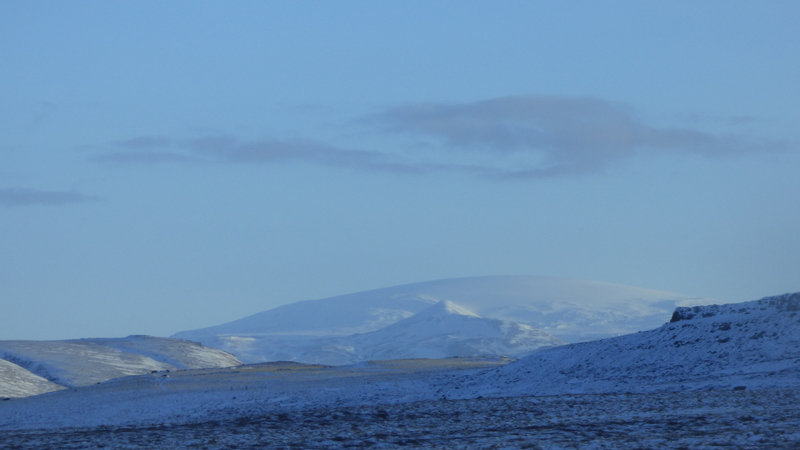 A beautful landscape of snowy mountains started to unfold. 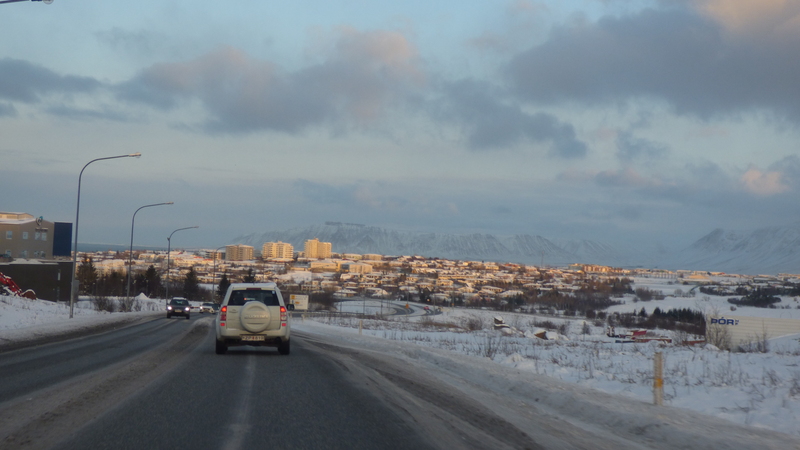 I hadn’t noticed the mountains in the backdrop of Reykjavik yet, as the sky and the mountains both where white and I vaguely thought little contrasts I saw were clouds. So that came as quite a surprise. Sun was rising. We happily chatted away all the way. Everything you see has a name. All sides to a mountain. All peaks, all inclines. Hilmar made a pitstop at a tankstation and he tried to find a certain seaweed dish for me. Unfortunately they didn’t have it. Peaky top and a glacier in the back. We stopped at a fabulous and powerful waterfall on the way, which I’ve been recording and filming in about 10 second footage for their textures. I imagined all elements to be members of an orchestra: a little slow stream a high pitched intrument, a flute. The big river playing several basses. Faster streams, strings, in different tempos and different angles and pitches. Icycles drips are percussion. And a wild raging river underneath us. 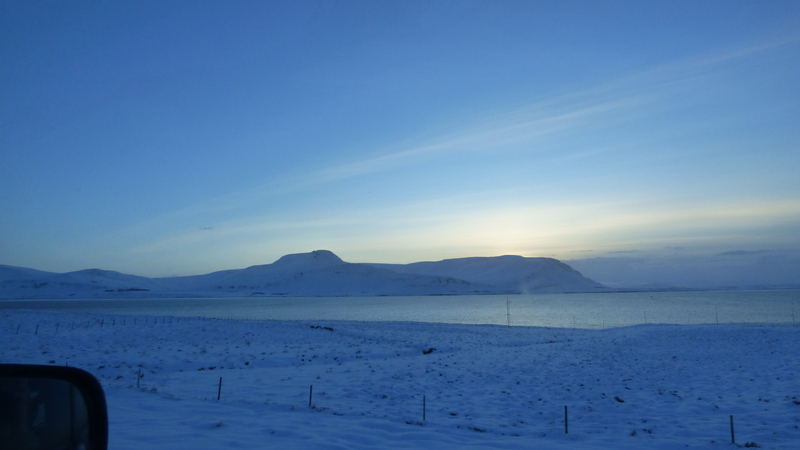 Hilmar said that it’s very easy to forget time visiting Páll and he set an alarm for when we had to return to Reykjavik to attend concerts at the Dark Music Days in the Harpa. We got a warm welcome from Palle, the coffee was ready and some sandwiches and cake waiting for us on the table. Páll is a visual artist, sculpting and painting, who has taken up music about ten years ago. He plays his self-made instruments. Hilmar and Palle were catching up in Icelandic for a while, which was a good opportunity for me to listen to the language, with the occasional English sentence. I was soaking up the atmosphere. 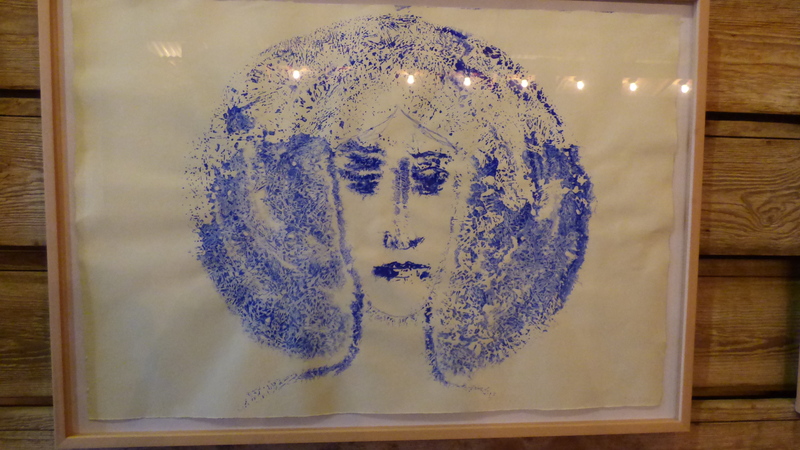 Like in all Icelandic homes I’d been so far, there’s a lot of original artwork on the walls. Such a great habit. It really colours a house with someone’s personality in taste of art. Palle is a visual artist himself, but there were plenty of other artist’s works present. 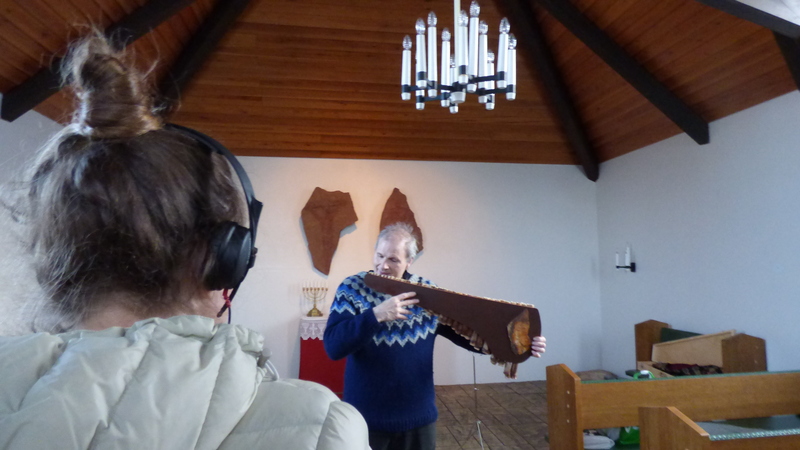 He showed a concert on DVD he performed with Sigúr Ros playing his self-made stone harp. We went outside around the corner of the house into a room and there it was. The stones are perfect pitch and some resonate strongly. 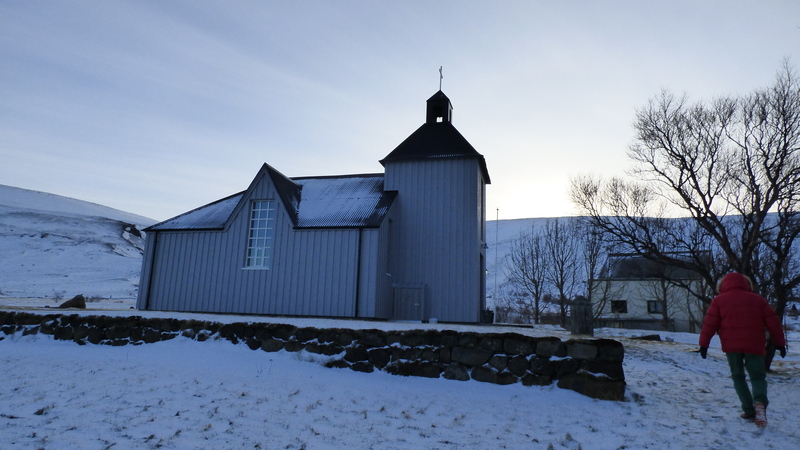 The small holding Páll lives on has a chapel, which was our next stop. Páll played his self-made pan flute made out of rhubarb stems (maybe of the rhubarb flowers?) which reverberated nicely in the architecture. Hilmar was listening intently. I started to record it and thought perhaps Páll would like to hear how beautiful it sounds and popped my headphones over his ears. He was smitten and started to flute every note singularly in various ways. Which is very useful to make a software instrument out of it. Páll and Hilmar quite liked this idea – the ‘Palle Rappapari’ instrument. 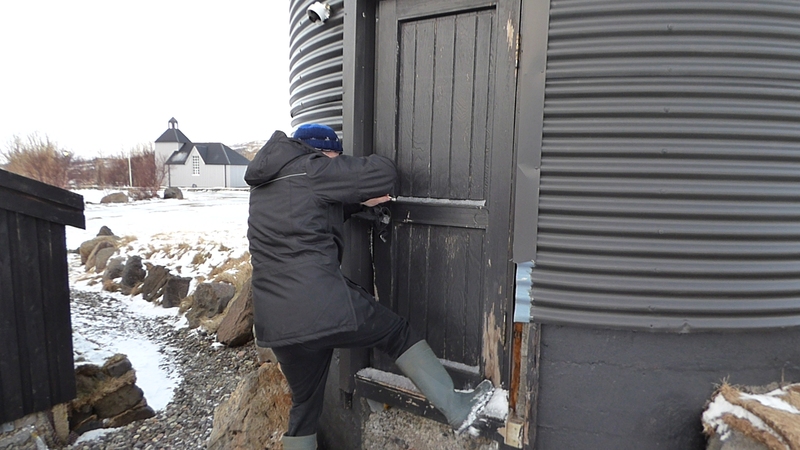 We went outside to walk on to the next shed. Meanwhile I pointed to the mountains and the cwm, valley, as they are so beautiful. 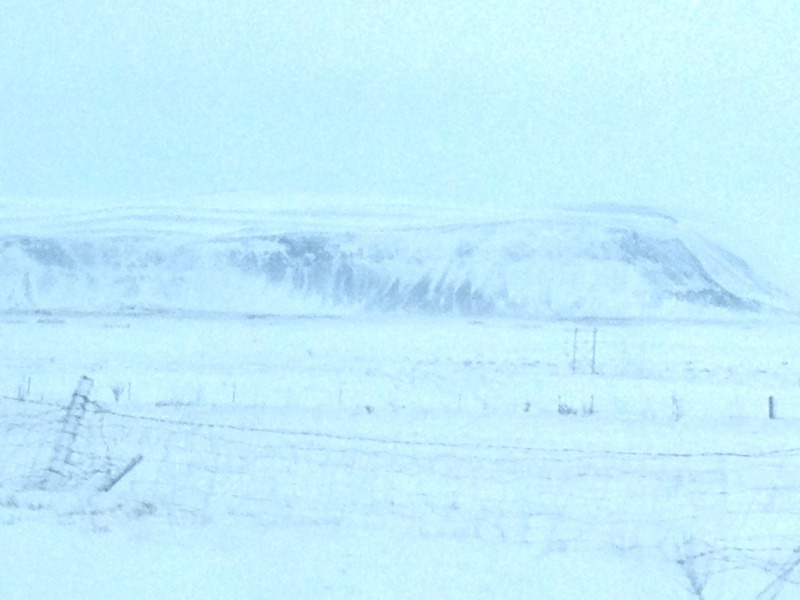 They are like a music composition to me: I suggested to Páll and Hilmar to imagine the white snow to be the white of a paper sheet and the darker bits are the movement of the music – here, from right to left the sound will go in soft waves, then a steep glissando of frequencies down, an accent chord distracting and an even steeper and compressed glissando of frequencies up, leading to faint staccato’s of sound holding their frequency and fading out. I was lucky with the snow. It was a nice crispy -3 that day I believe. 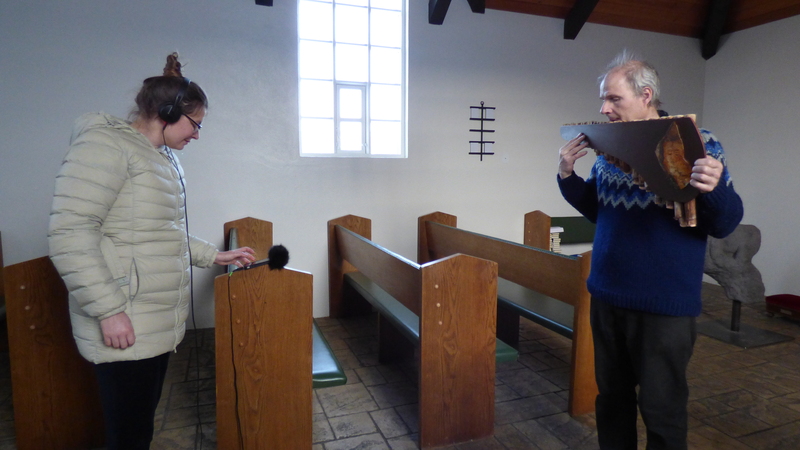 Kammerkór Suðurlands has been working with John Tavener, and this particular piece was programmed to be performed on a date which turned out three days after his passing away. So there’s a deep connection with the choir and the composer. 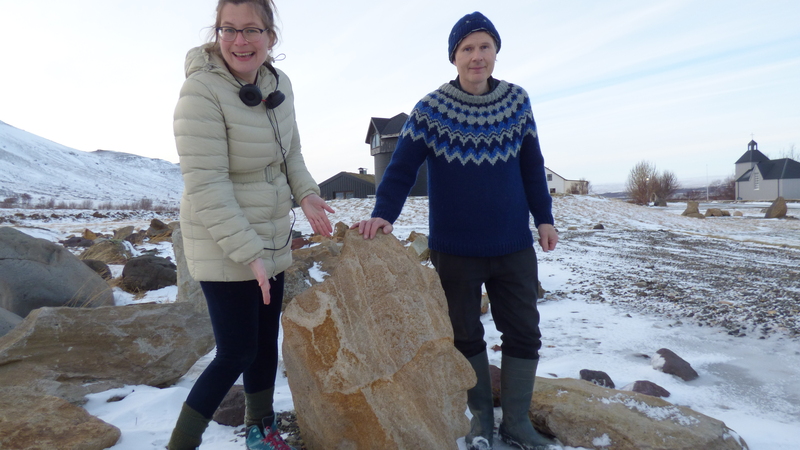 This is a sculpture of John Tavener that Páll made and Hilmar thought it was a good spot for a picture of the both of us. Have you ever been in a shed that is warm??? I haven’t. Usually they’re cold and damp and nasty. Only half comfortable in Summer. To Be Avoided in Winter. 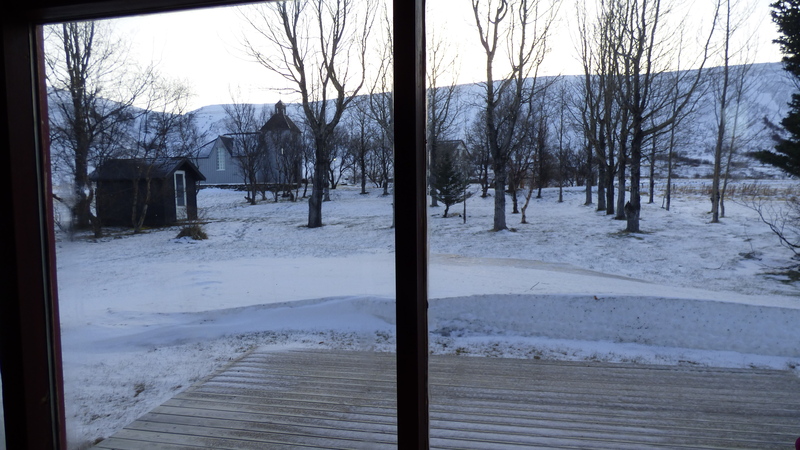 Ofcourse in Iceland there’s thermal heating. Still the concept of a warm shed was baffling to me. In this shed there were plenty more stone harps. 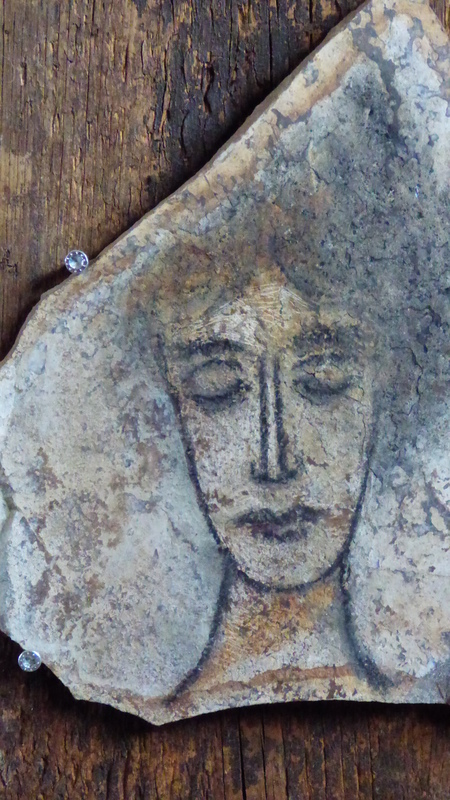 Pall has sculpted or carved into some of the stones, which give it a very precious and personal magic. After recording the flute, we thought we might as well record all the individual notes of the harp as well. 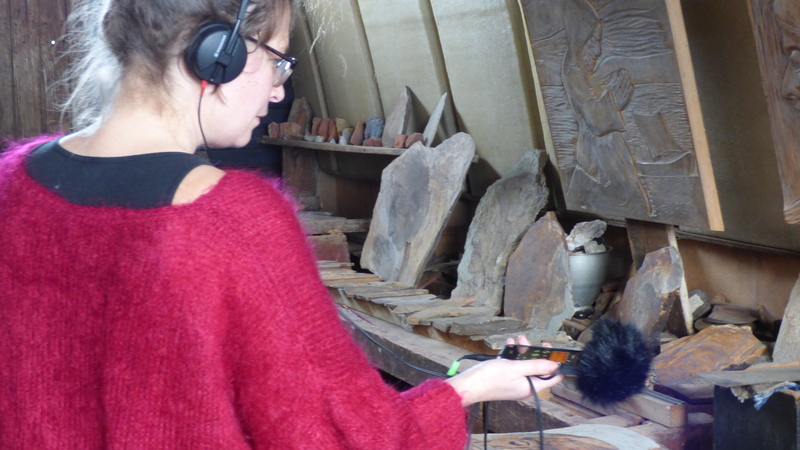 Trying to find the right spot to record the stone harp was a bit of a challenge. 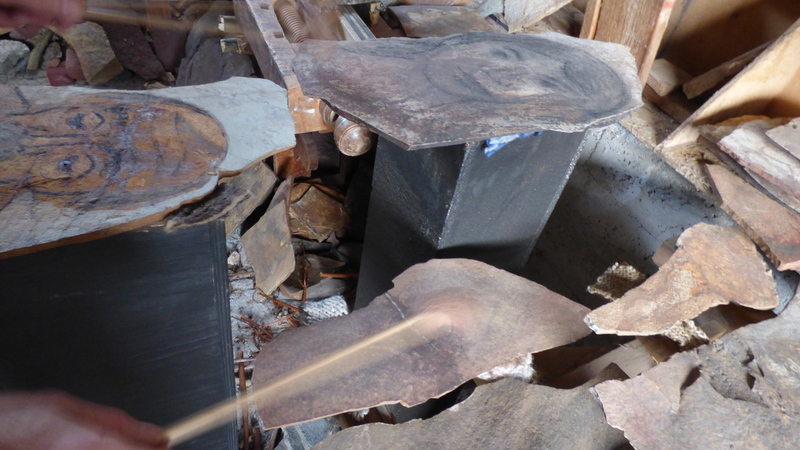 I’d be tempted to record it again, well prepared, situating the stone harp on a wooden resonant box. Yet often it turns out these spontaneous recordings become very valuable for their imperfections and other qualities. There was a little dripping sound in the background and I wonder if this sound might actually add something special. We still hadn’t been into this building, which is a gallery, and another one – called The Gallery. But Hilmar’s alarm had gone off, it was time for us to go. 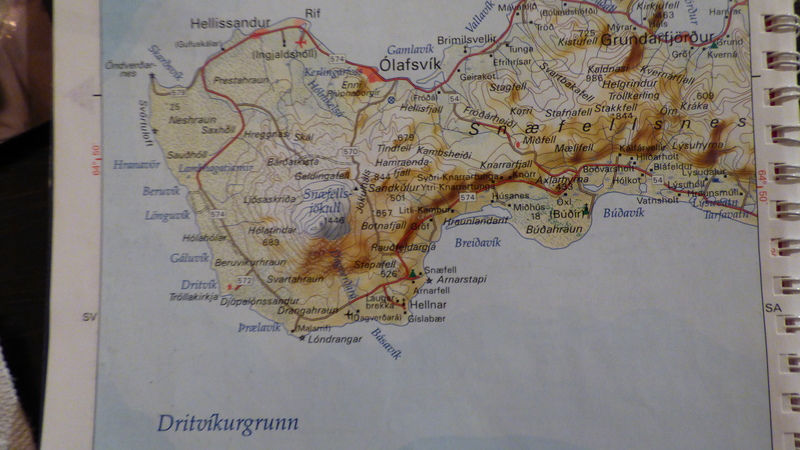 Additionally, just to make sure we hadn’t got lost in time, Björg phoned Hilmar to check. Husafellt is a time vortex. We spent a quick peek in both. 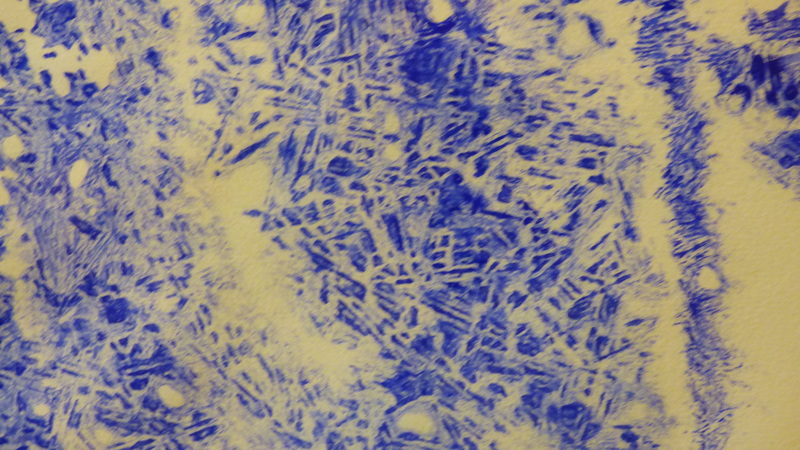 In this picture below Páll uses a technique of painting on ice and presses the paper on top of it. See how the paint starts freezing and creates these lovely geometric textures. In the car, on our way back, both Hilmar and I took some time to reenergise by calming down and saying sweet nothing. Enough experiences of the visit were roaming around in our minds to let sink in. I was trying to sleep for a bit, but whenever I closed my eyes I felt I was missing out on the landscape so I opened them again. We were on our way to attend an evening of the ‘Dark Music Days’ music festival in Harpa, the stunning concert hall of Reykjavik. 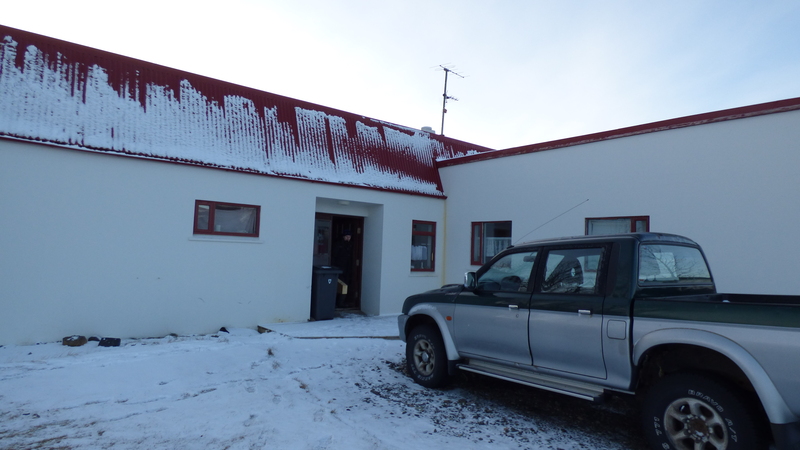 Björg kindly invited us over for a dinner at her family’s – it was ever so interesting so see another Icelandic home, again so warm and welcome and full of art. But alas, the reindeer didn’t want to hurry up cooking so we had a quick sandwich instead. Cheese and jam, which again tasted much better than home, ha! 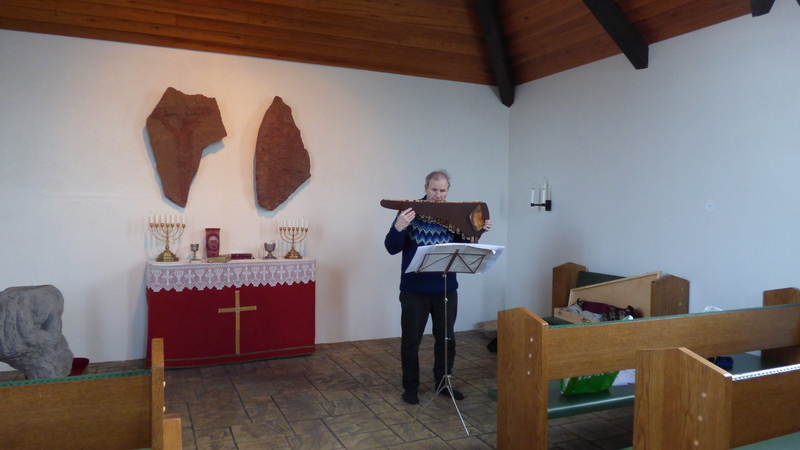 Rolf Wallin’s ‘Act’, Þórður Magnússon ‘Píanókonsert’. Örlygur Ben joined Hilmar and me. He teaches music and music theory and is a composer. 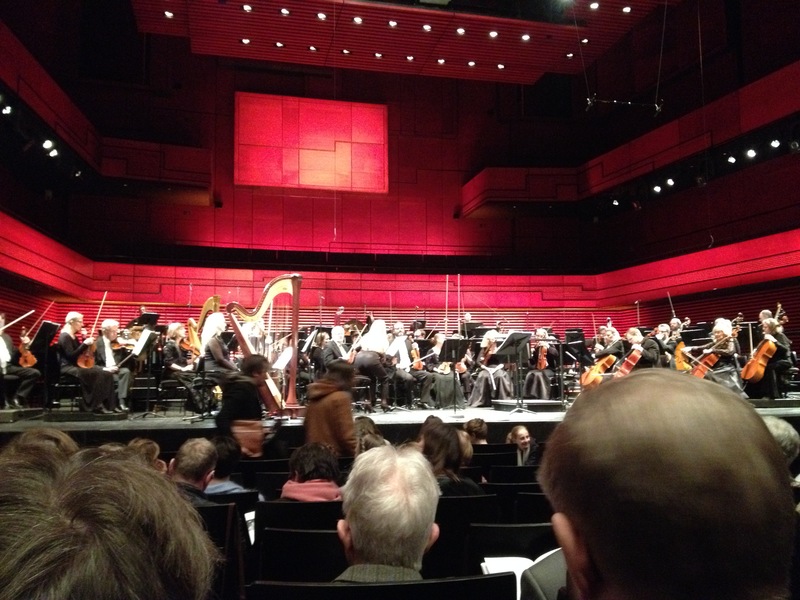 The Harpa main concert hall sounds superb and the pieces were very good. A nice variation in textures. I must admit that I got utterly absorbed by the page turner of the pianist in ‘Píanókonsert’. Her appearance and flowing movements reminded me very much of a Tim Burton character and I imagined all the music were the thoughts that were swirling and roaring in her head – I had a great time. After the concert I met Gunnar Andreas Kristinsson, we’ve met before in Poland at the ISCM WMD Wroclaw in 2014, where a piece of his was performed, as well. He’d studied composition in The Hague and speaks Dutch. More familiar faces from the Wroclaw festival were present this evening, such as Kjartan Ólafsson, founder of Dark Music Days a.o., this was the first year he stepped back from it, and Signý Leifsdóttir, managing director at Tónverkamiðstöð. I quickly said hello to both. Signý recognised me first. Hilmar, Olle and me together with Gunnar went to the musicians bit after the concert, I was introduced to a few more people. Also the harp player, Elísabet Waage. She too studied in The Hague and speaks Dutch and is a good friend of Björg. Hilmar was very keen for me to try rotten shark. An Icelandic delicacy. Especially in combination with dried fish and schnapps. I could already smell a distinct smell when we got into the space, which I thought to be quite comical. 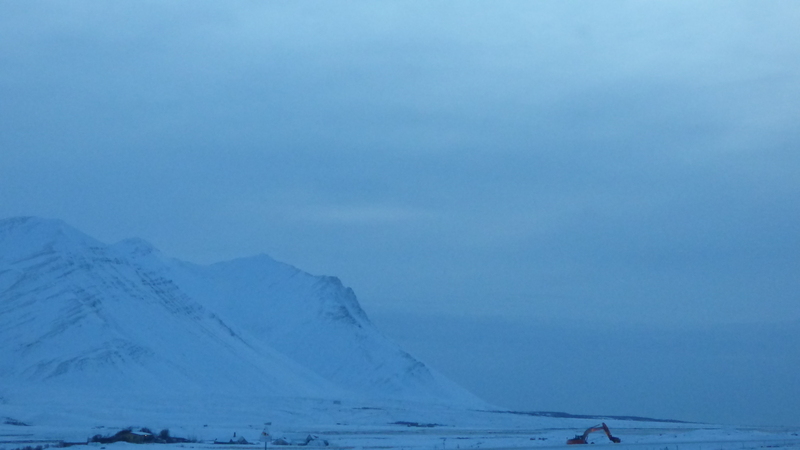 It was a fishy ammonia smell which can only appeal to Nature people such as Icelanders. Being from the Netherlands and Britain I cannot imagine this in these cultures to be regarded appealing and special delicacy. I quite like fish so I was very curious to try. The texture of the rotten fish is slightly weird and the ammonia taste comes last. There’s a faint taste before that. I had 4 pieces to try to work out what it was like. Altogether it was quite alright, yet it’s different to me as I don’t have a nostalgia with it. Liked the dried fish too… as well as the schnapps. I was very curious to try it, as I think ‘fermented’ shark might be more correct, although rotten shark sounds better. I’ve been reading this book about Roman dishes, very interesting, and they use fermented ansjovis sauce, which is fish sauce, in everything two thousand years ago. They were crazy about it. Only in very recent history, something like 1900s, a Chinese scientist found out why – it’s the natural MSG that is generated in the fermentation of ansjovis, maybe fish in general that pleases out sense of taste rather than rotten aspect. The book is called ‘Aan tafel der Romeinen’, I have to dig it up to reference it properly. As far as I know only available in Dutch. After all that, we brought some people home in Hilmar’s car and I was dropped off at Fossegata …only to pack my bags to go to again. It must have been nearly 11pm. 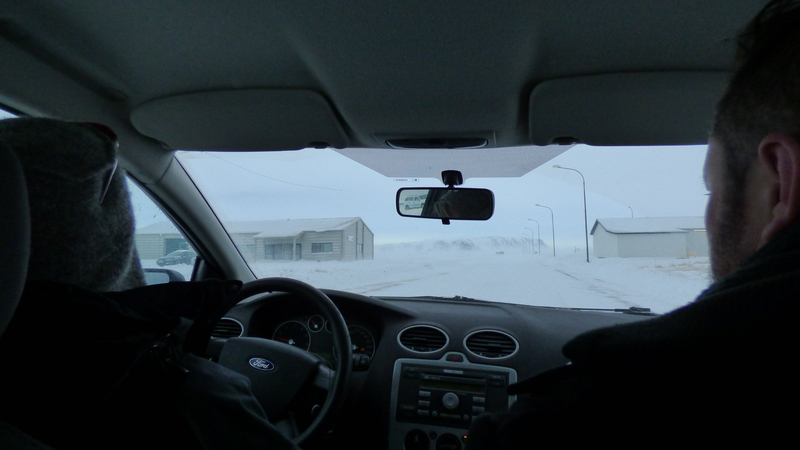 Örlygur Ben (Ölle) and Rebecca were picking me up to drive us to their home in Eyrarbakki, an hour’s drive away. Rebecca had been working late at Uni till that time. She teaches Russian and Russian culture. I had forgotten I didn’t have dinner and it was a perfect opportunity to have a hot dog at a petrol station. I’m repeating myself on the food front, but: it was delicious. 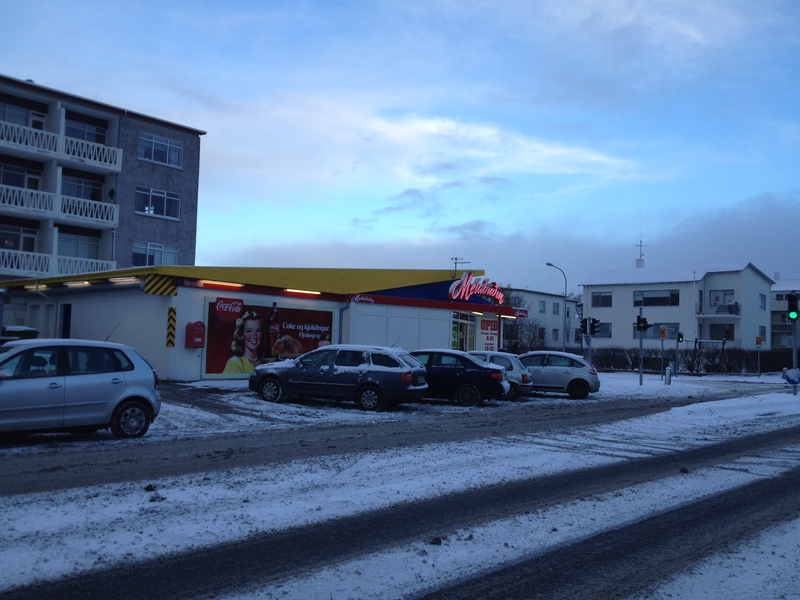 Happens that hot dogs are quite a thing in Iceland. We continued our drive. 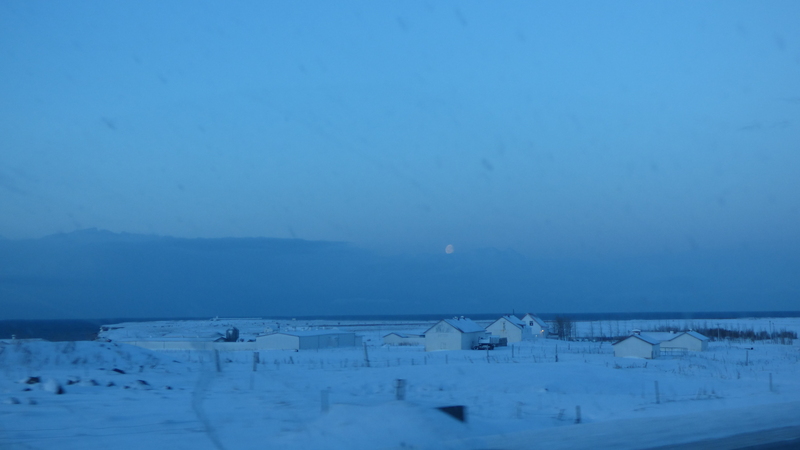 The wind was picking up and all I could see was a very lonesome icy road in the dark dark night with ghostly snow drifts hoovering feverishly over the road’s surface in the car’s headlights. We arrived at about one in the morning, or maybe a bit earlier. Anyway, we wanted to have a relaxing moment with a drink. The three of us chatted away effortlessly till 4am! I need a book to write it all down. There was a painting in the house by Guðrún Kristjánsdóttir I really liked, looked very scifi. See, again original art everywhere in people’s homes. We talked about Russia, in particular about Moscow. About my Limburg language and about preskop, a sandwich filler I saw in the shop which is I thought to be quite typically Limburgish. It looked exactly the same. Ölle had this interesting question whether there were any Limburg folktales or sagas, I never thought about that, I don’t know of any. That’s perhaps why I’m focussed on finding parallels in food in other cultures. Old food dishes. And we talked about that there are all sorts of festivals in Iceland all the time. For whatever reason. In Winter, because it’s dark and there’s nothing else to do. In Summer, because it’s Summer and it’s always light. Rebecca and Ölle cooked up a plan to have a dinner party the next day and invited two friends over. Insomnia was lurking but I brought my Tense apparat to defeat. And once again with success. I was saved. 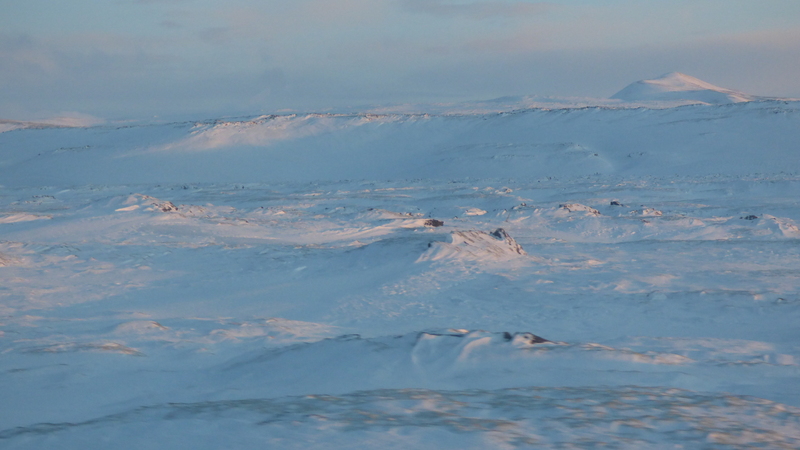 Still a lot of snow the next morning from my Eyrarbakki window view. It’s a very pretty village with lots of history. We had a nice slow start in the morning after our nightly drink session. 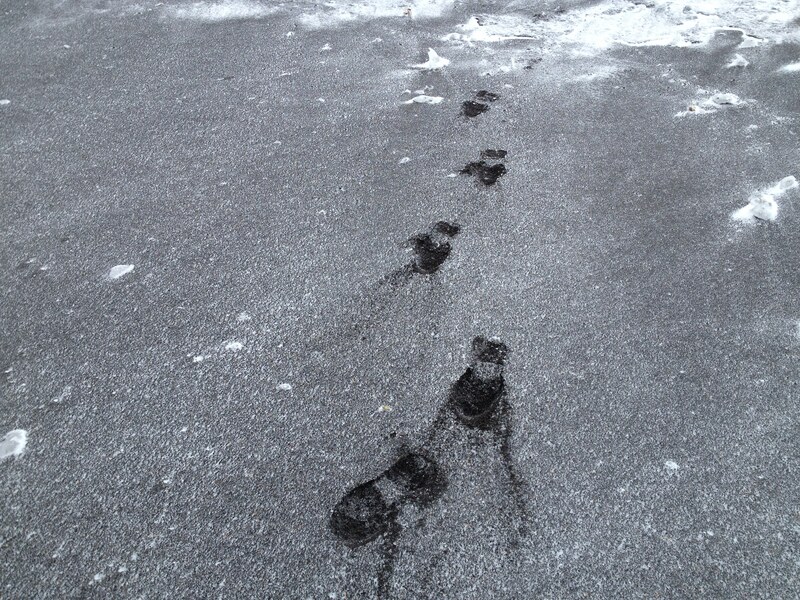 When I did surface I was keen like a puppy to go out for a walk. 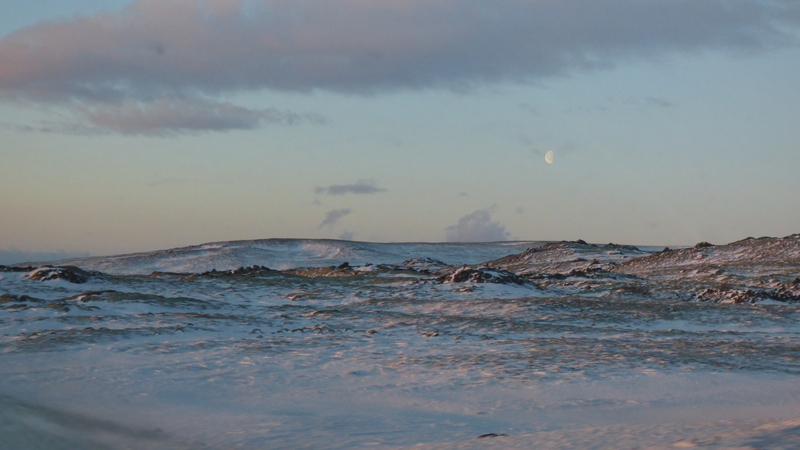 It was quite rough weather, snow storm and gales. Maybe my walking plan was a bit enthusiastic. Ölle and Rebecca were great. They drove me to some nice spots to see the beach and ocean. As soon as I got out of the car it was very obviously not weather to go out for a stroll! Bracing but awesome. Ölle mentioned it was -9 Celsius. 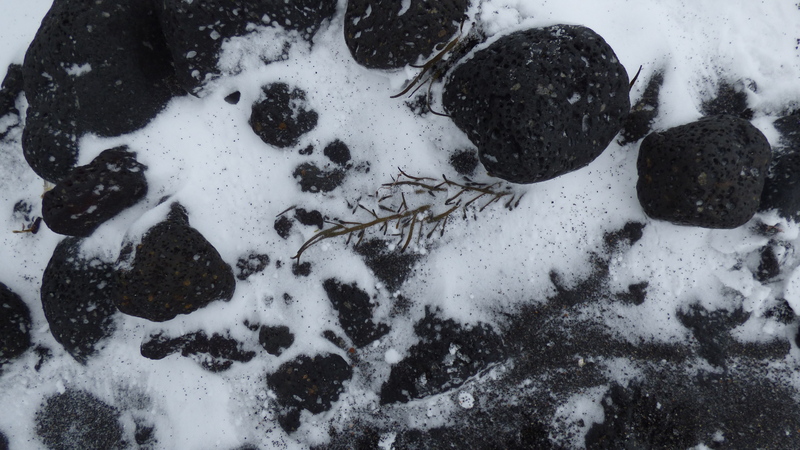 The beaches have black sand. Beautiful. 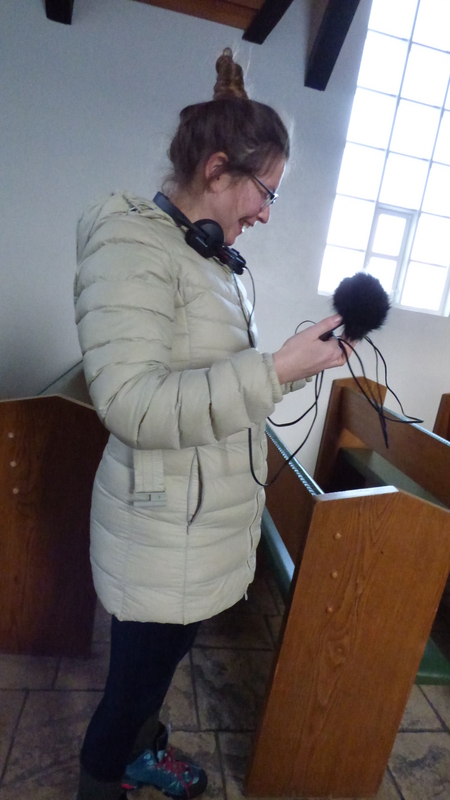 I brought my lampshade-with-old-tights windshield for my stereo mic which was already wrapped an earmuff-wind-shield. This was the right opportunity to test its capacity. 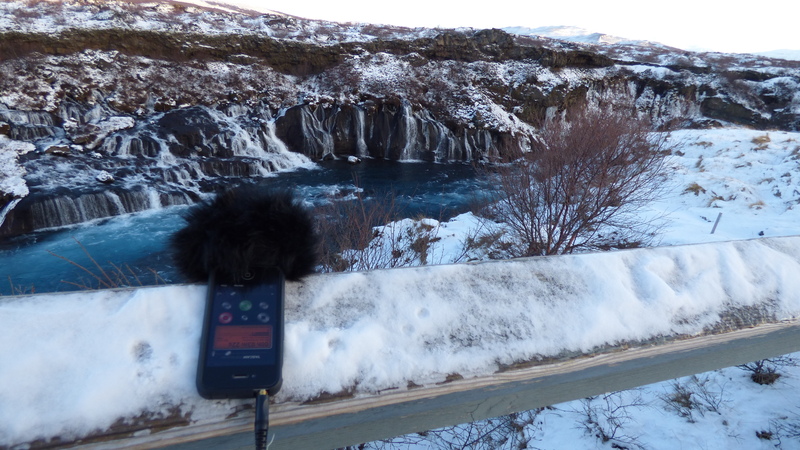 Lo and behold, I was able to record some very strong whistling of wind in the blazing gales, no problem. It made me very proud. There were some drying fish dangling from a balustrade of a building in the strong winds, I thought was quite interesting. This building was a community hall I found myself in a few minutes later. Rebecca was talking to a lady about the history of the village and there were some old black and white photographs hanging on the wall she was talking about. Her English was excellent. Coming from a village in Limburg and having been living in villages around Pembrokeshire, I find these bits of information very interesting. This is how people live. 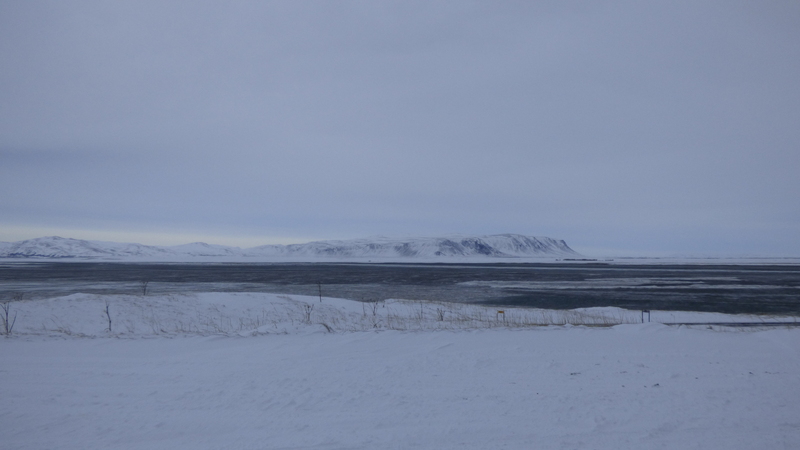 From there we continued around the estuary of the river Ölfusá. 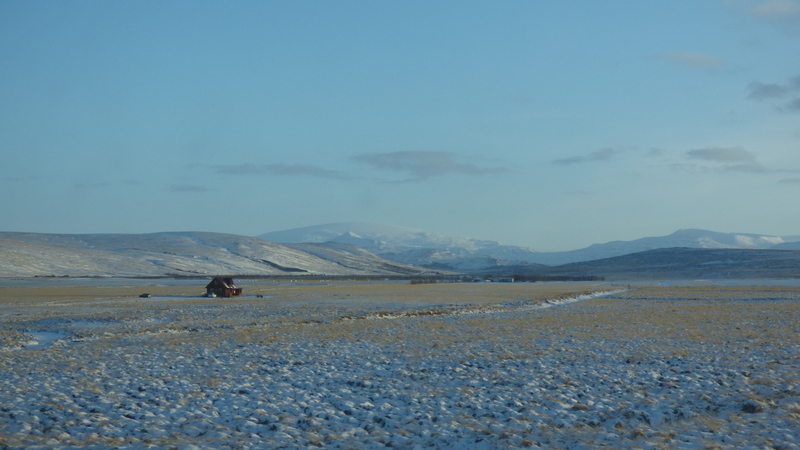 It was the long touristy way round to a supermarket in Selfoss to get supplies for the dinner and as such I could see some more of the landscape. The battery of my Lumix was dead as I had forgotten to charge it at night, so I continued on my iPhone. I got totally obsessed again about the white snow being the white of paper and started to shoot away like a maniac, trying to find perfect compositions in the scenery. Ölle explained a bit about the scenery, and that there is the Flói Bird Reserve, but not much was necessary as I was very happy in my snapshotting bubble. The graininess of the iPhone photos enhances the feel of paper grain. And shooting from a driving car brings a certain distortion. Basically, what perhaps makes a really bad picture makes a really good composition. Some examples below. 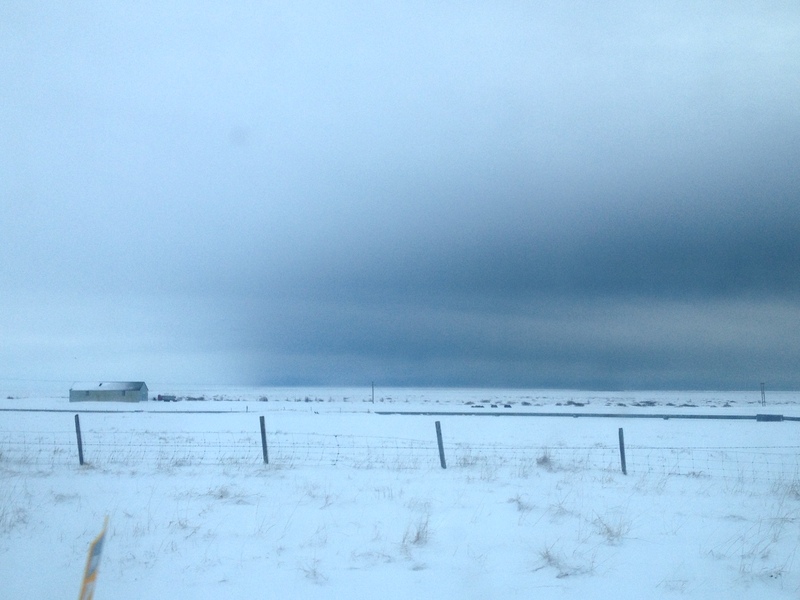 The weather turned quite dramatic. Big fun in the supermarket. It’s the time of year the Icelanders have traditional food festivals which, if you’re not used to it, could easily be translated into ‘horrible food’ festivals, with burned sheep’s head, rotten shark and all the more of that. Which were present in the supermarket. I bought a few relatively safe goodies, compared to that, like smoked trout, dried fish and the very dark and heavy rye bread I was introduced to at Hilmar and Björg’s on the first night, to take home with me. Onto the liquor store and the fish mongers (were they had a BAG full of scallops in the freezer – yum). This was all beginning to look like a pretty good party. With more white fish. Ölle was worried I got fed up by white fish by now. The only food restrictions I had given to them was ‘anything but chicken’ as ‘contemporary’ chicken really doesn’t agree with me. I replied that I probably would have been disappointed to not have fish. Surprisingly Iceland hasn’t got as much of a culture eating fish as I thought. 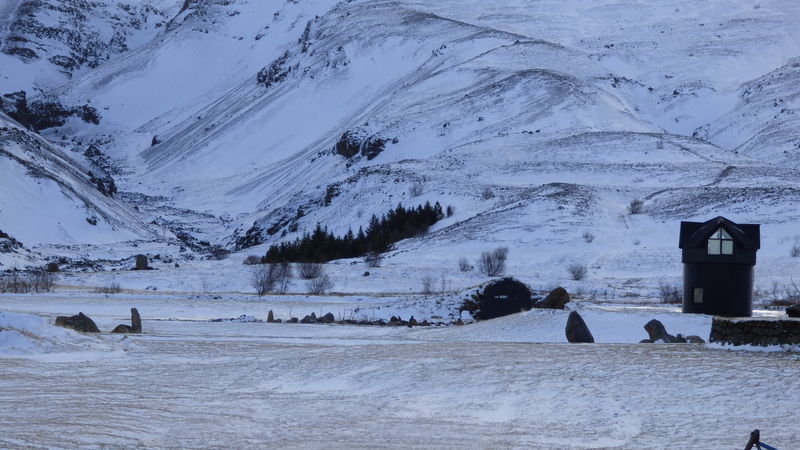 The next day I heard Fjóla say lamb to be more the national dish. The dinner was fantastic. Great food and great company. And a great night sleep the night before, so I was how I’m supposed to be. The guests were really good friends of Ölle and Rebecca, Magnús Karel Hannesson and Inga Lára Baldvinsdóttir. 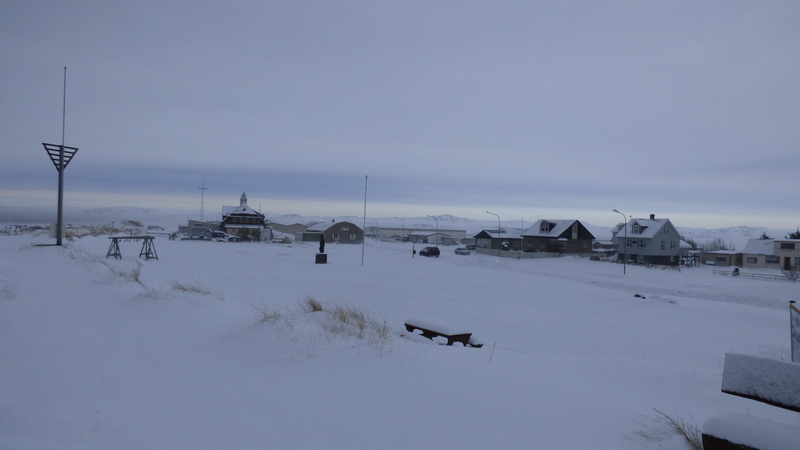 Magnús had been mayor of Eyrarbakki before the municipal changed. He now runs a shop in the village and most peculiar crafty things in the house were shown to me as things from his shop. Inga Lára is historical photographs specialist. Both of them, again, spoke excellent English. It’s admirable how the Icelandic can switch to English in their own company, because there’s just one non-Icelandic speaker amongst them. I’m determined to learn some of the language, but of course, that won’t help me in big discussions. Maybe merely to buy something in a Puffin shop. 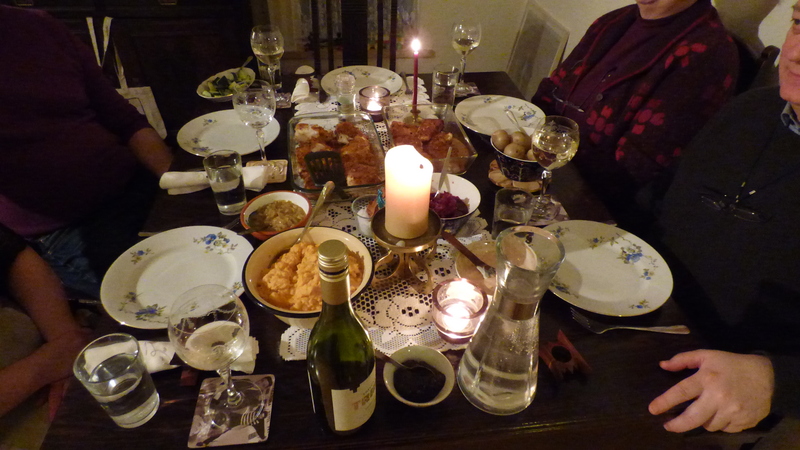 Rebecca had been the cook, Ölle made some effort to dress the table very nicely for our party. 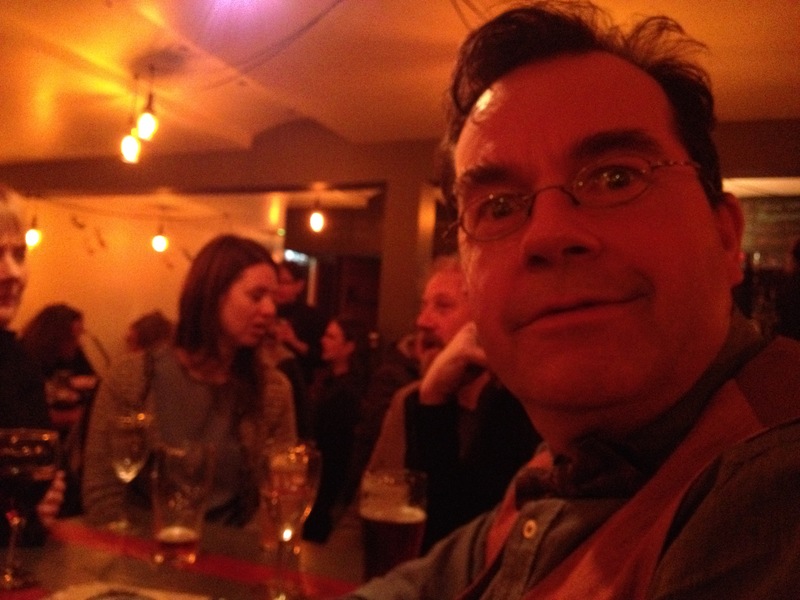 The dishes were fried fish in bread crumbs, turnip and sweet potato mash – did I get that right? – which was very light and tasty with certain spices, red cabbage, potatoes, cucumber, fried in butter onions, and two sauces I forgot. And nice white wine to accompany. The men were trying all sorts of beer. I was quite curious to try too, but maybe another time. Apparently there are a lot of season beers around. The couple are locals from the area and have great knowledge about it’s history and everything that’s going on. 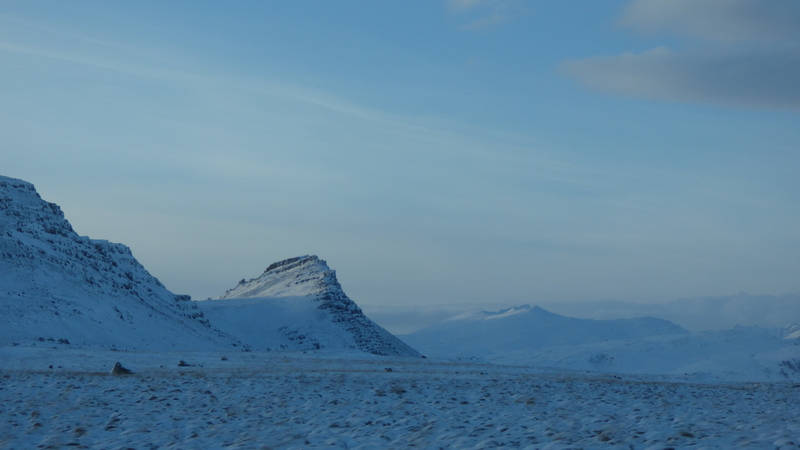 It became clear that actually they have a lot of knowledge about entire Iceland. We have been chatting for 4 hours non stop. Magnús and Inga Lára showed us a newspaper cut out album of a storm that had been very damaging and flooding the area in the 1990s. I noticed that the sea waves seem to be very slow, or maybe far away. 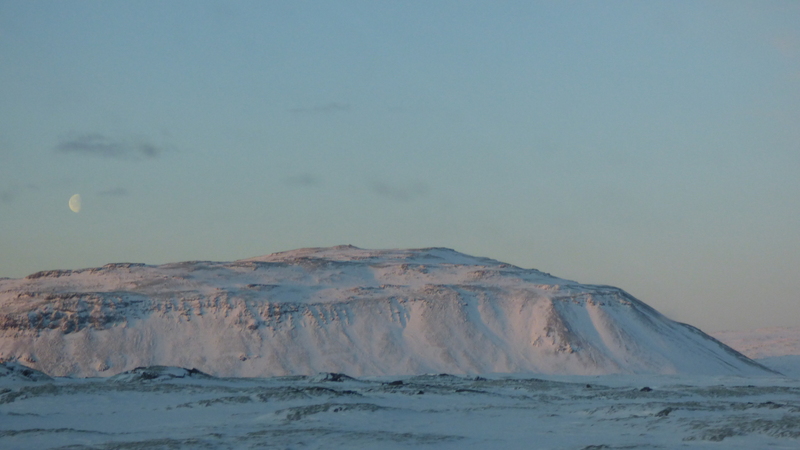 Magnús answered that this is because they have high cliffs at Eyrarbakki too, only in the sea. Seen from the beach, the first 300 metres are shallow followed by a sheer 17 metre drop, which the big ocean waves bash into and break up. 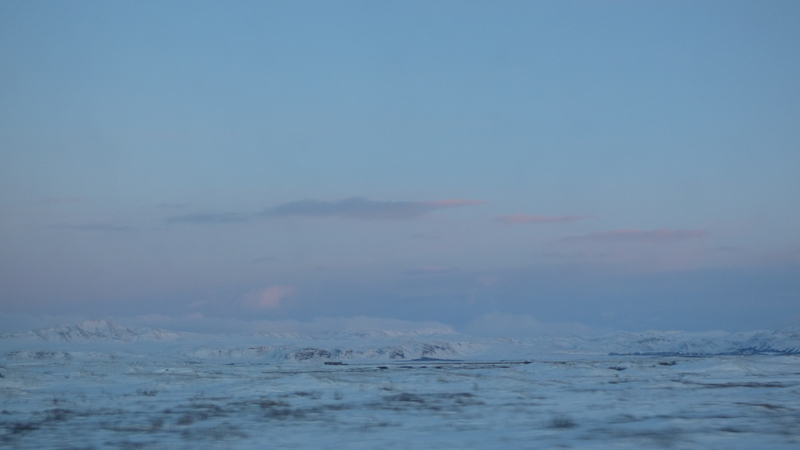 If you look in the distance, in a straight line, the first land you’ll come across is the Arctic. So these waves have plenty of time to build up enormous power and look slow because they’re huge. We got talking about my Kammerkór Suðurlands commission and what I had in mind. Having the choir sing over the ocean surface, with sounds reflecting from cliffs or objects. I told them about my house on the cliff top above the ferry port in a natural harbour with high cliffs. How the sound of the ferry hoot breaks up and reflects from miles away. That I wanted to start a competition to find the words for it. That we were thinking about the relation between Iceland and Hull, that there’s been a Cod War, which may or may not be a good idea. 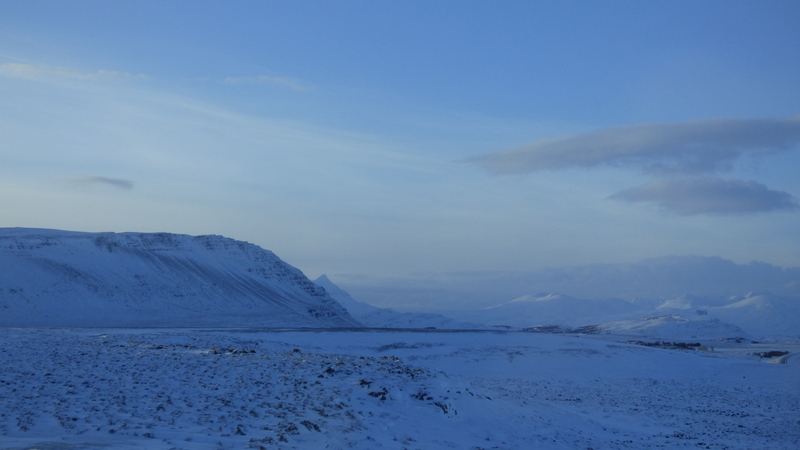 I’m neither English nor Icelandic, so I feel very neutral and it’s interesting history to me. 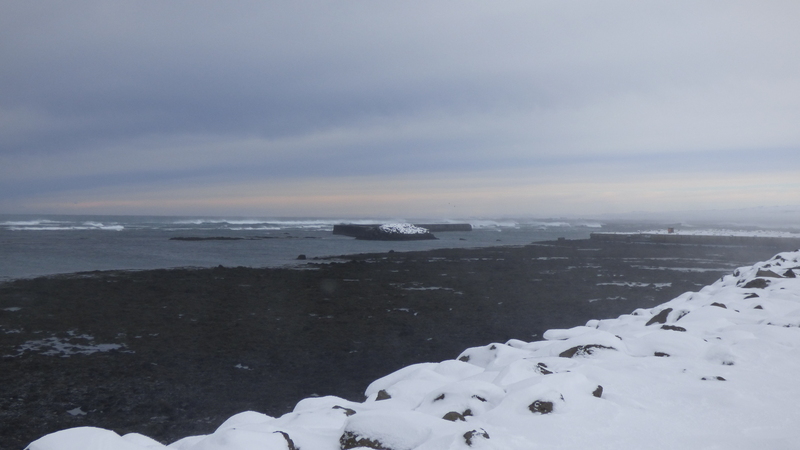 Inga Lára mentioned that the relation between Iceland and Hull and Grimsby has been a longstanding one and the Cod War has merely been the end. This is something I’d would like to have a look into. Because if we are going back in time for quite a bit, I might speed up time for a bit more and park up in sagas, as well, to see if there are poetic parallels or something of significance to be found with regards to this topic. Collectively the four of them started discussing suitable places with natural harbours and cliffs for reverberation; describing them to me; debating how one might be better then the other. It was wonderful. Sculpting thoughts and opinions. Rebecca later said to me she was amazed about how Inga Lára and Magnús seem to know Iceland like the back of their hand. 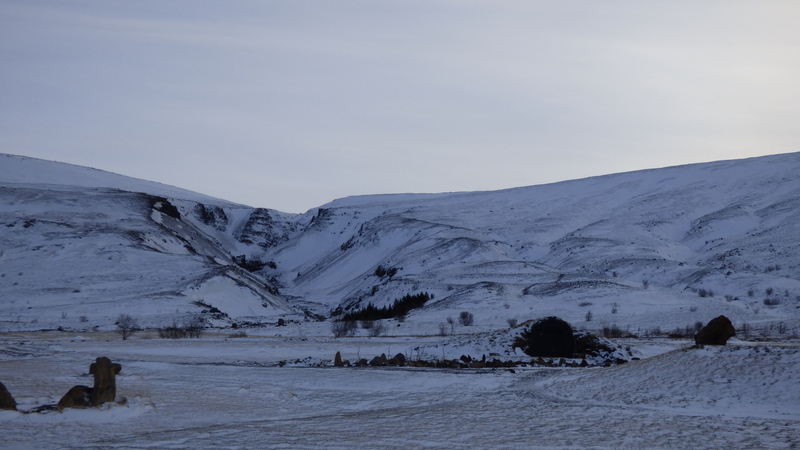 The favourite place ended up to be somewhere close to Hellnar …only a 3 hours drive away from Reykjavik. 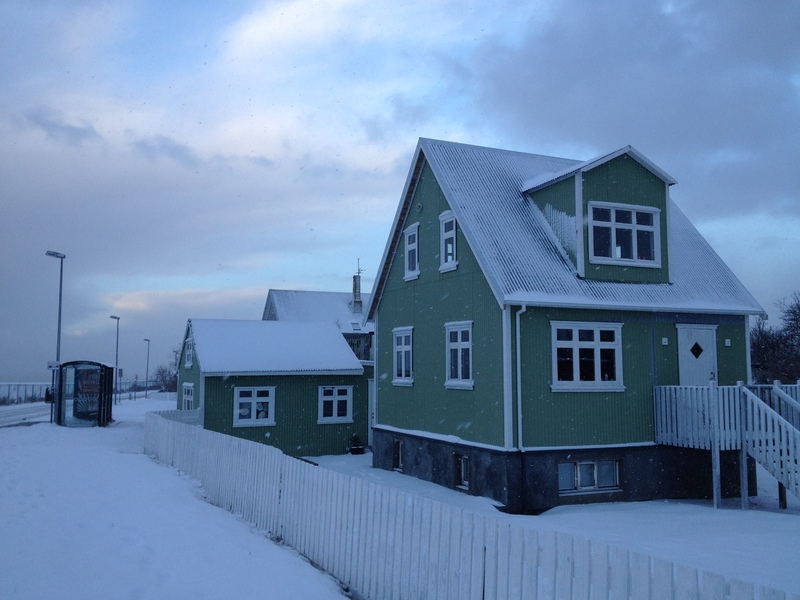 Cycle festival will be in Kópavogur, just outside Reykjavik and nowhere near to Hellnar, so things are very much in development what it is we’re going to do. But the information that is offered to me during this R&D visit sheds light from many angles. We were talking about cliffs and harbours and I started to talk about the last invasion of Britain, which happened on the headland just around the corner were I live, in 1797. There are some good stories about it, which all are captured in a tapestry in Fishguard. This tapestry is a true work of art, designed by Elizabeth Cramp and realised by a group of local women for the bicentennial anniversary of the invasion’s defeat in 1997. Rebecca and Inga Lára were very interested, I should send them the booklet about it. Somehow we got talking about seaweed and I kicked off. I started talking and talking and the others kept asking more and more questions. It was great. Next time I’m over they asked me to give a seaweed workshop. I guess everyone went to bed very pleased that night. 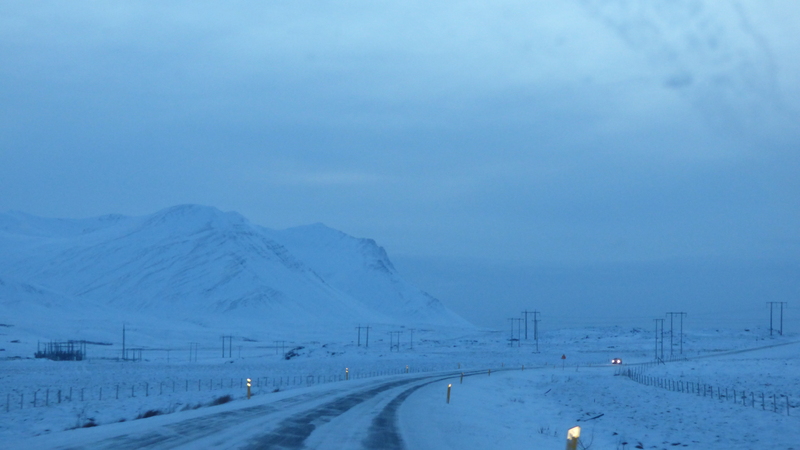 Ölle and I were on the road to Reykjavik in the following morning at sunrise to attend the next choir practice. 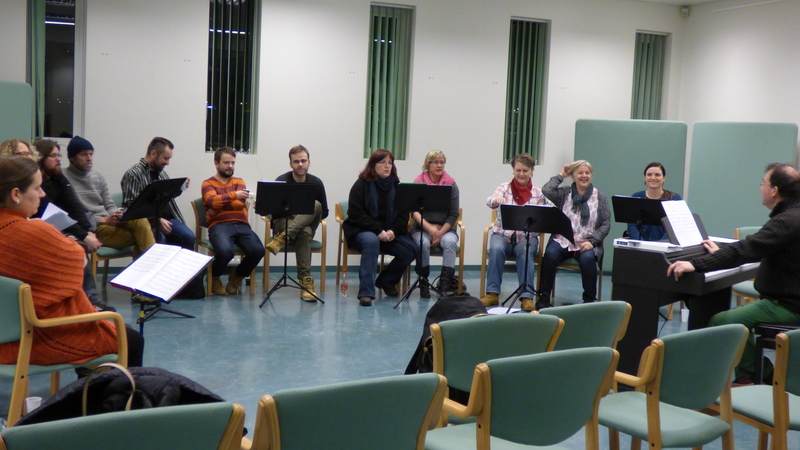 Georg Kári Hilmarsson, Hilmar’s son, had come over from the States to Iceland for a while and rehearsed with the choir his piece ‘Birta’, in English ‘Brightness’. The choir was going to perform it in a concert in February. This was my luck, as Georg uses a lot of boxes in this work and a lot of freedom in timing and execution. Something I make use of in my compositions as well, and as such I experienced how the choir worked with it and how flexible they are. “You can’t do anything wrong”, Georg said to the choir members, which were exactly the words I said to my performers at Vogue a week before. It’s not a surprise, in my opinion. I think composers rooted in nature in one way or another might tend to use this type of composing as it sits very well with your personal expectations. 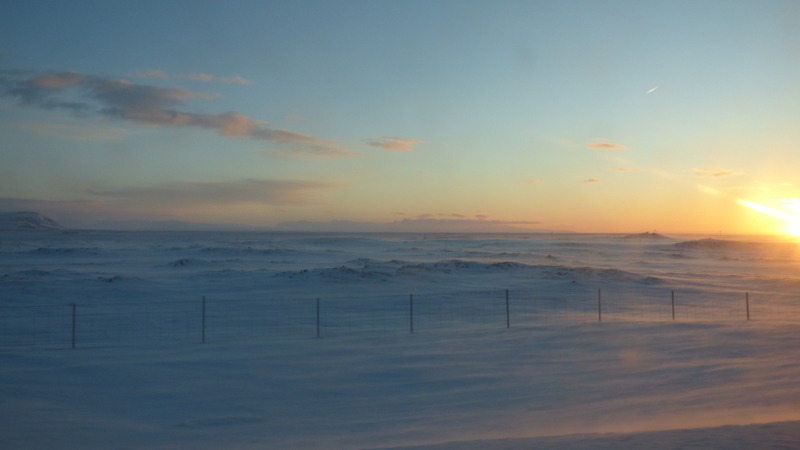 You know what a sunrise looks like, for example, still each day is so very different. Tying it down to set parameters as found in traditional annotation wouldn’t do it justice. ‘Birta’ is a beautiful piece, it sounded great. Thorunn was at the rehearsal too, she was being very logistics in the background. 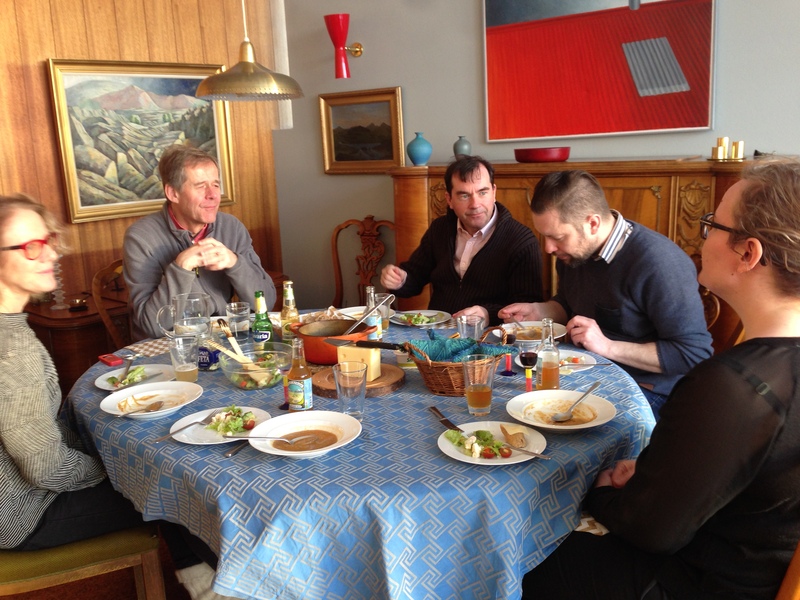 Hilmar, Ölle, Thorunn and me were kindly invited to have lunch at Sigrun Steingrimsdottir, one of the choir members and her husband. 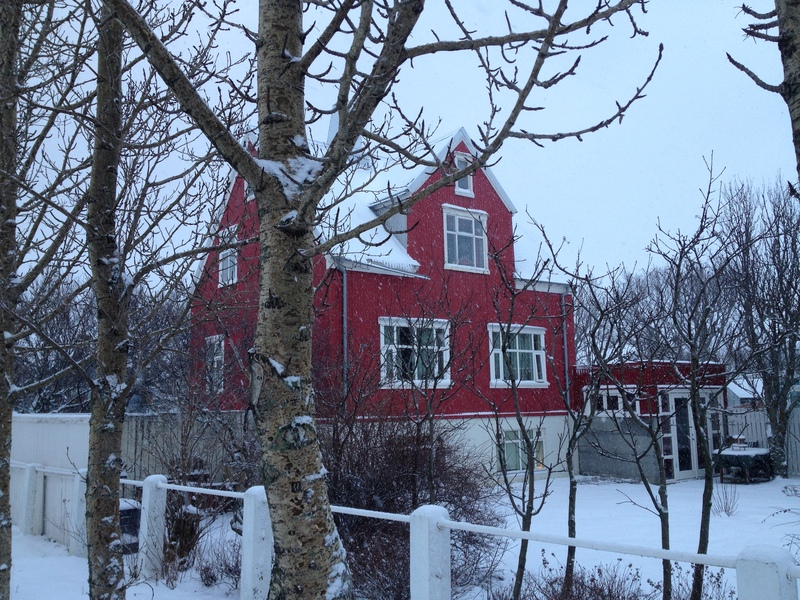 Their house was stunning, in one of the nicest streets of Reykjavik, facing the ocean. A sea of light in the living room. Full of art and colour. If I understood it well, the husband’s father built it in the ’50s. Very modern for its time. We were spoiled. Sigrun had some lovely fruit juices, we had a Moroccan soup with salad and amazing nice bread. Great cheese. And something close to ‘vlaai’ (a Limburg delicacy) for afters! A French recipe, very good. 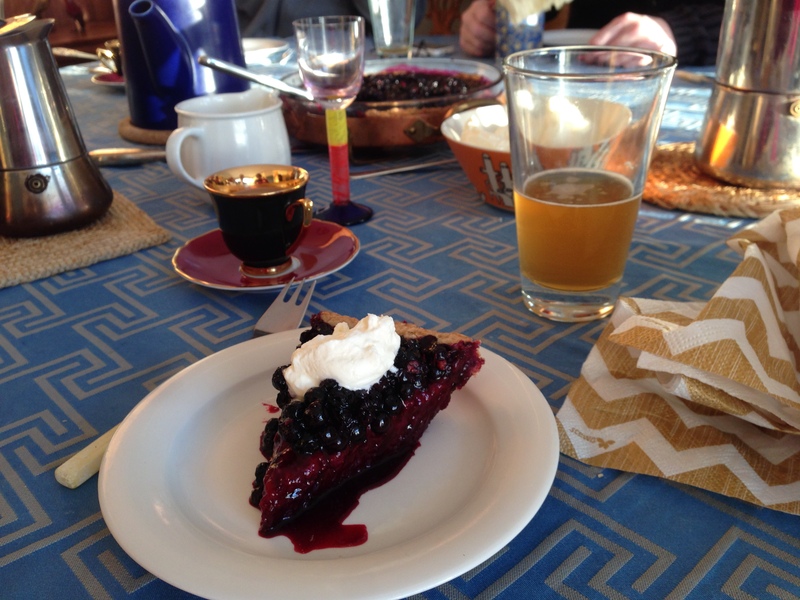 Most of the blue berries, maybe they were bilberries, on the pie were picked around their Summerhouse. 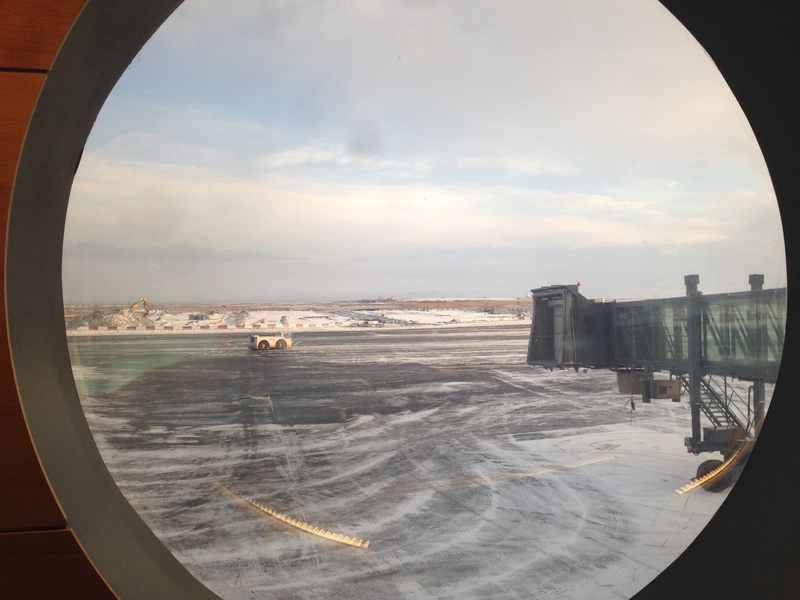 …I can start a recommended Icelandic dinners and lunches book. Similar to the colours of the sunrise one experiences, I’m describing the colours of my stay what I’ve been experiencing. 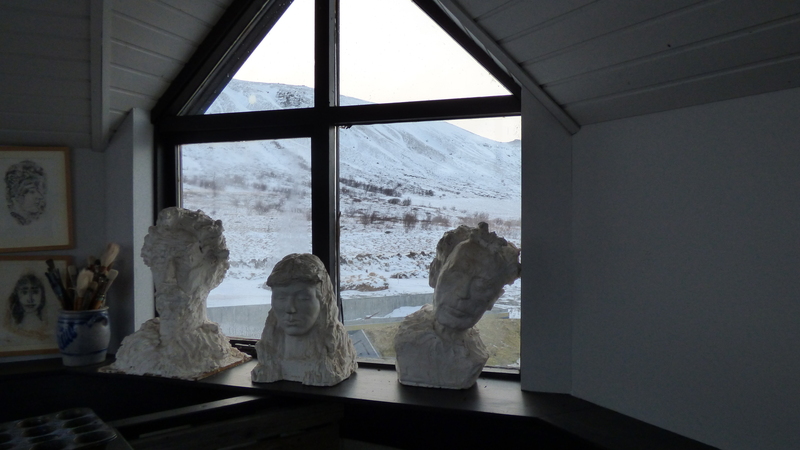 We talked about Hellnar, they have a Summerhouse close by, and ideas for the new piece. Some questions about me and my work. And there were some things we needed to arrange for. 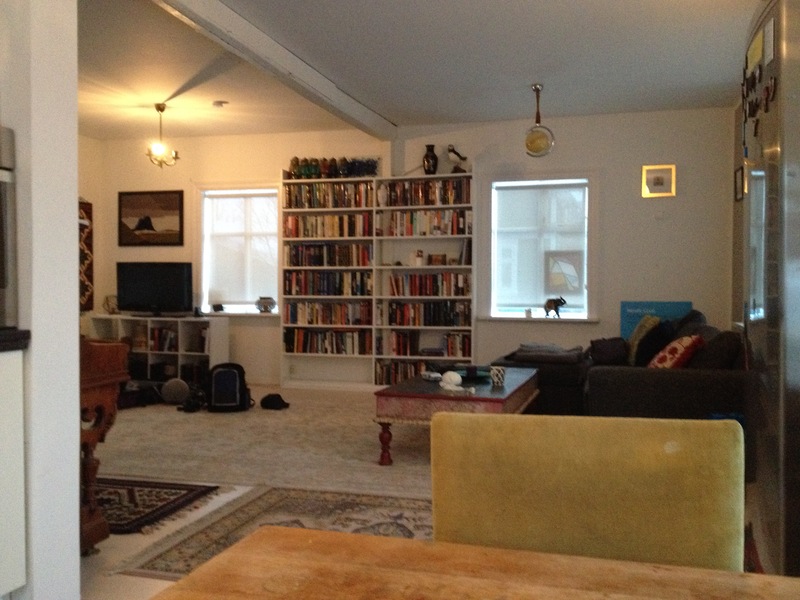 This house was an oasis. I said “bless bless” to Ölle and was dropped off back at my ol’ place at Fossegata, were my suitcase was diligently waiting for me. The ‘Dark Music Days’ were in full speed, we wanted to hear some performances, but I really needed a change of clothes. I thought my black and green check suit with green and blue check coat would be the business. Sherlock Holmes times ten. Female edition. Just in time I realised I was leaving in the early morning and had to pack up before anything else, in case it would get late. Thorunn and I were going to a few concerts at the festival late in the evening and then to the closing party. That turned out to be good thinking…. 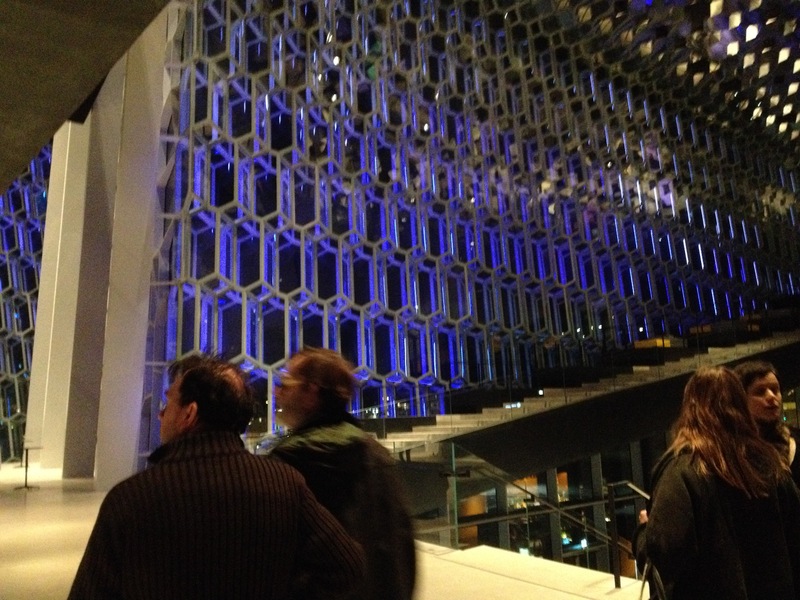 Not enough time was left for me to walk 30 mins to the Harpa, even though I fancied it. Thorunn and I shared a taxi, she came to pick me up and we went to a hip pizza place without name they not necessarily serve pizza either. Both of us weren’t very hungry after the fab lunch, so we nibbled on a starter. Yes, more fish for me. 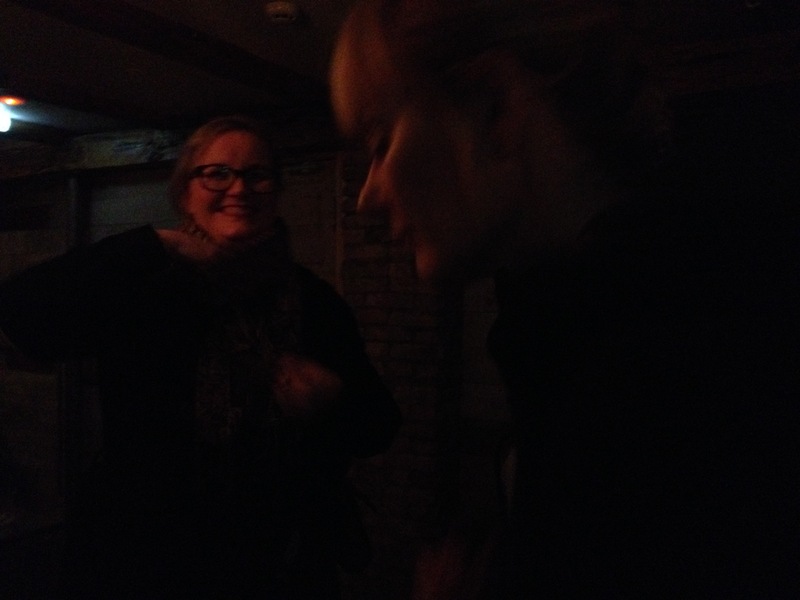 It was really lovely to hang out with Thorunn for a while. We’ve got similar kind of humour, which is always good. We talked about music and things and soon moved on to talking about feminism. 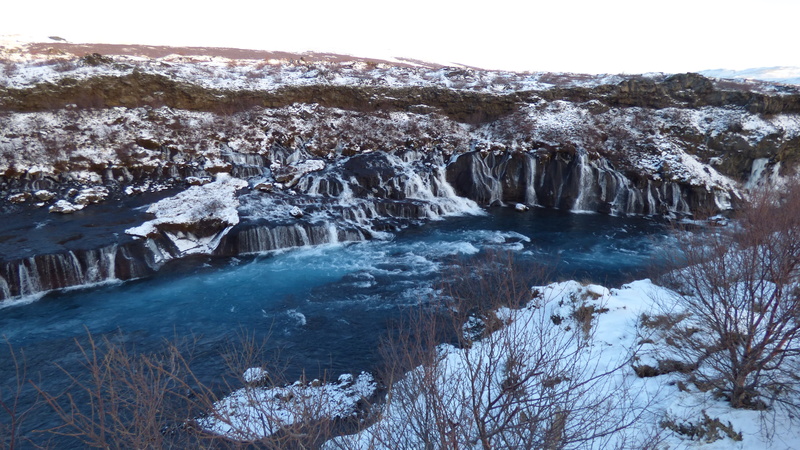 She’s got a son and she said lots of women in Iceland have children early twenties and then go studying. Reasoning it can’t be harder then having a baby. There’s great childcare available and all the ladies I met on the first night out have children and are still going out and having careers. In the Netherlands and in the UK women have to make this horrible decision whether to have a career or stop everything for the babies and maybe resume later if you’re lucky, or work unreasonable hours matching work with family life. I know of many frustrated mothers, I never even questioned having children. Seeing these strong women in Iceland really made me happy. Happy to know there’s a place where circumstances are different and even though maybe still not ideal – what is ideal? – but very much better. In Harpa Thorunn and I went to see two concerts of Hlíf Sigurjónsdóttir at 7pm and Erki-Tónlist 8pm. At arrival we met up with Fjóla, this year’s festival organiser, who was slowing down as it was the last night and very hungry and very tired. But happy. 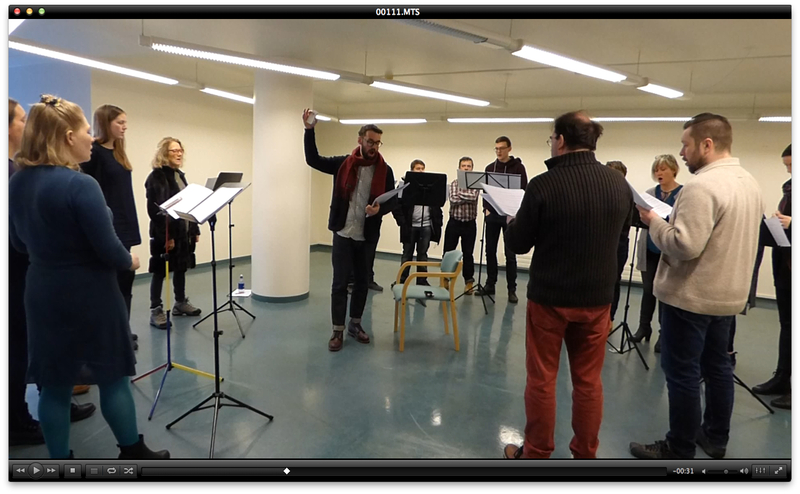 The 7pm concert was very experimental, as in still under development, with open source code. At the 8pm concert we saw Signy and caught up with her. Thorunn showed me around Harpa, we went to the top by elevator. I hadn’t photographed a single harbour and boat yet, this was my opportunity. Then walked down the steps. Now, the wide steps. What cadence are they in? 3/2? A one and a halver? That makes you wobble. Ah! two little steps at the time. But then you always end up with the same foot down first, as if you’re limping. How to do this elegantly? I had to ask Thorunn. 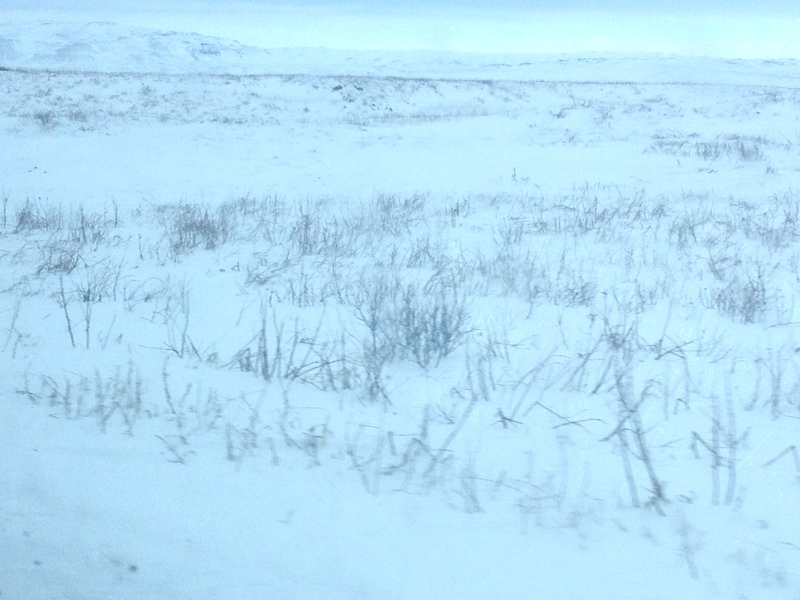 She said that Icelandic people gave up on elegance a long time ago, since everyone has to penguin over the icy roads. 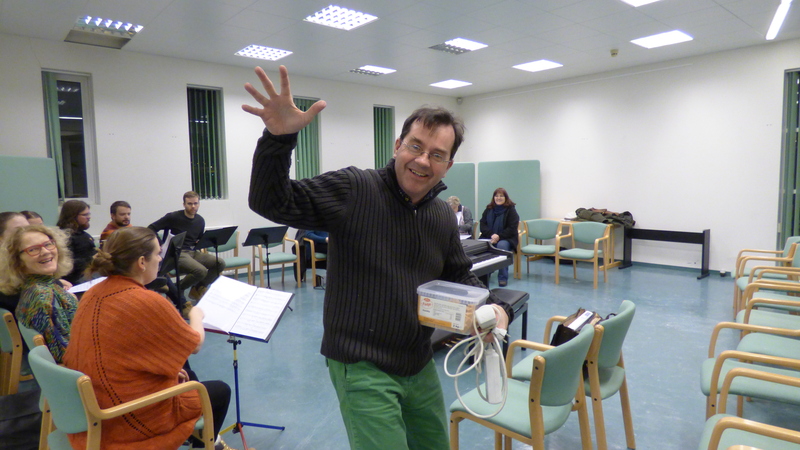 Hilmar joined us after the 8pm concert, he had his brother’s big birthday, so it was great he came out at all! We had some drinks together at the closing party. It was great to let our hair down – hurray! – although I didn’t entirely, trying to keep in mind I had a plane to catch in the morning. We went into town after that, to some pubs, it was such fun and all a bit hazy. And a hot dog. 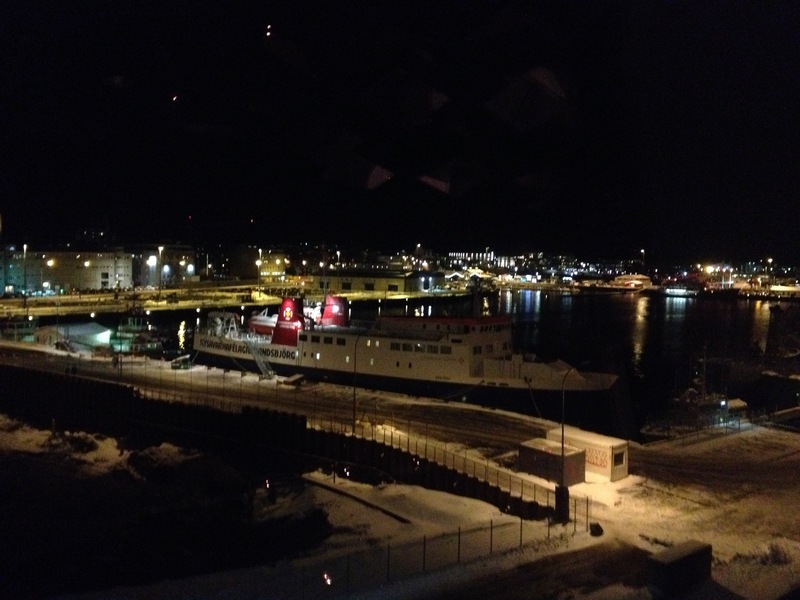 Arrived at Fossegata at 3:15am. Out at 7:30am into a taxi at 8:10am. Hilmar, Thorunn and yours truly. 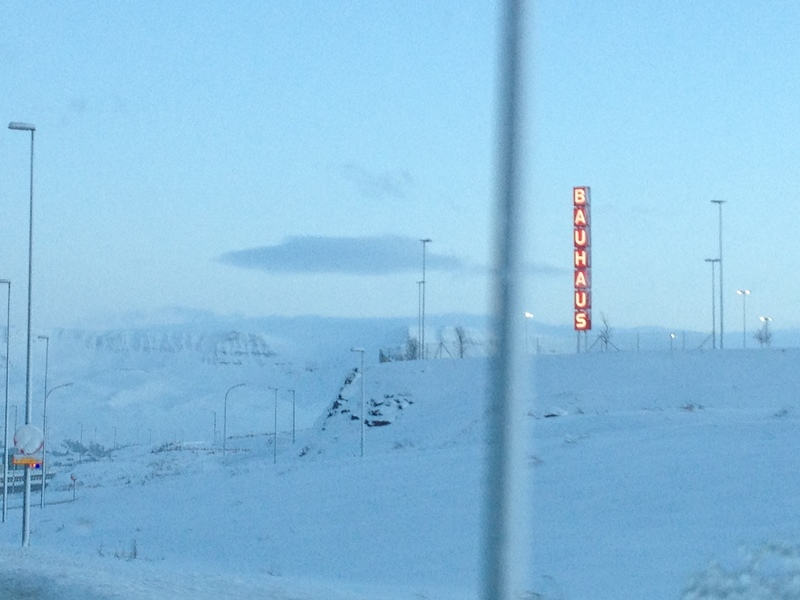 Bless bless Iceland. Sjáumst you wonderful people.